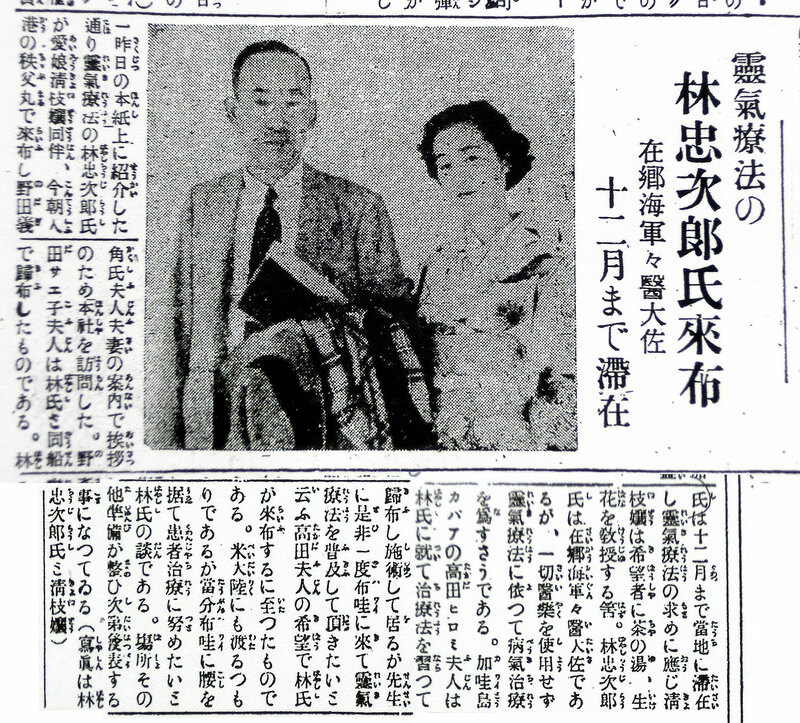 Master Chujiro Hayashi (林忠次郎) stayed in Hawaii from October 1937 to February 1938 and promoted Reiki with Ms. Hawayo Takata. 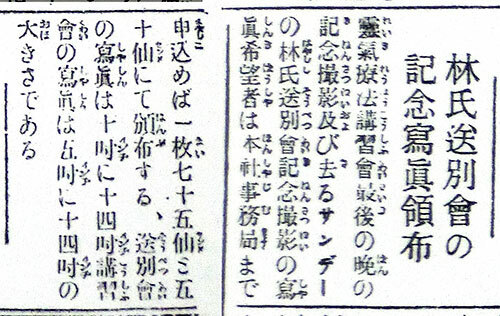 There had been vague information about his visit to Hawaii, however further details have been discovered since Mr.Justin Stein, a graduate student at the University of Toronto who specializes in religious studies, and his co-worker Ms. Hirano Naoko (Waseda University), discovered some articles in “Hawaii Hochi” (a newspaper published for Japanese who lived in Hawaii). Mr.Stein shares some important articles on his website, however, it is difficult to understand the whole picture as there is no analysis of the historical background. 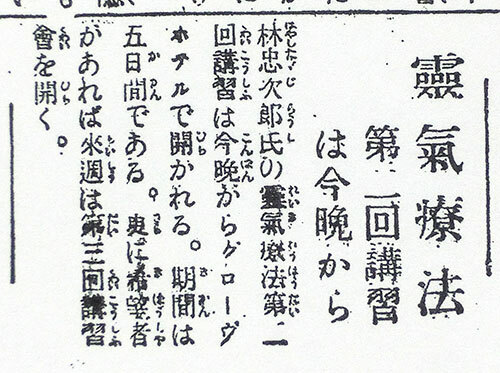 A few Hawaii Hochi articles have been shown during the Jikiden workshop, however, I felt it was important to provide additional information since some parts are misunderstood. I have discovered 71 articles and advertisements that are related to Reiki by researching microfilms from September 1937 to June 1938. (the original newspapers are owned by Hawaii Bishop Museum, and had been filmed under the budget of the National Diet Library of Japan. The information includes many facts and photos that have been unknown until now. I would like to release this information with my own analysis, or if you would like to take a short cut and look at the summary, please jump here. 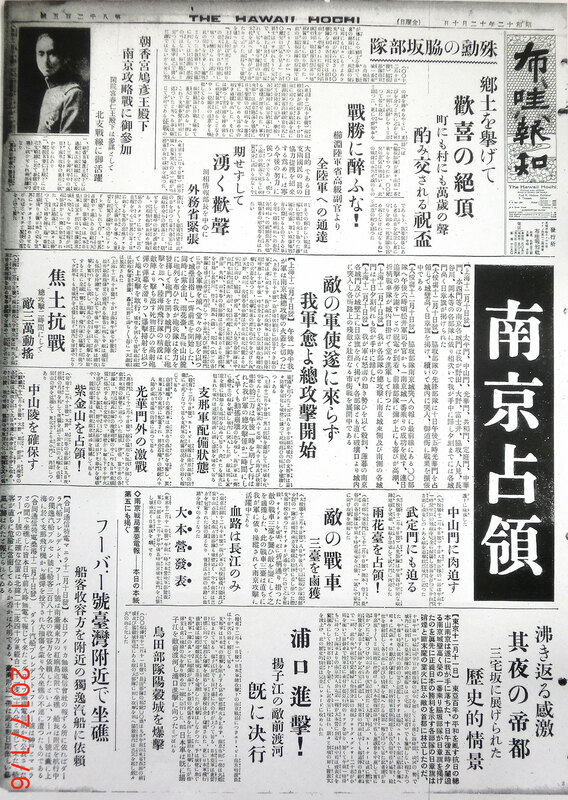 These articles can be found in the archives on the 4th floor in the new building of the National Diet Library. I have typed out some parts of the important articles, although, it was difficult to deal with the older form of kanji characters. Please let me know if you notice any typing mistakes. Thanks Mari Okazaki (Jikiden Reiki dai-shihan) and Mike McCarty (Jikiden Reiki shihan-kaku, Board member of Jikiden Reiki Association of Canada), the original Japanese manuscript has been translated to English by Mari and futher edited by Mike. Their efforts enabled this report open to English speaking Reiki practitioners. 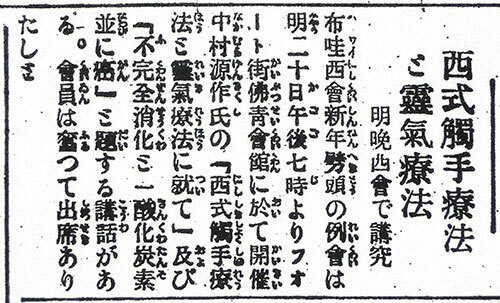 Minor articles and advertisements, which sometimes carry important information, are yet to be translated. Please be patient. As for Ms. Takata's traveling history, there were some ambiguous understandings until now, which I was able to clarify almost completely this time. 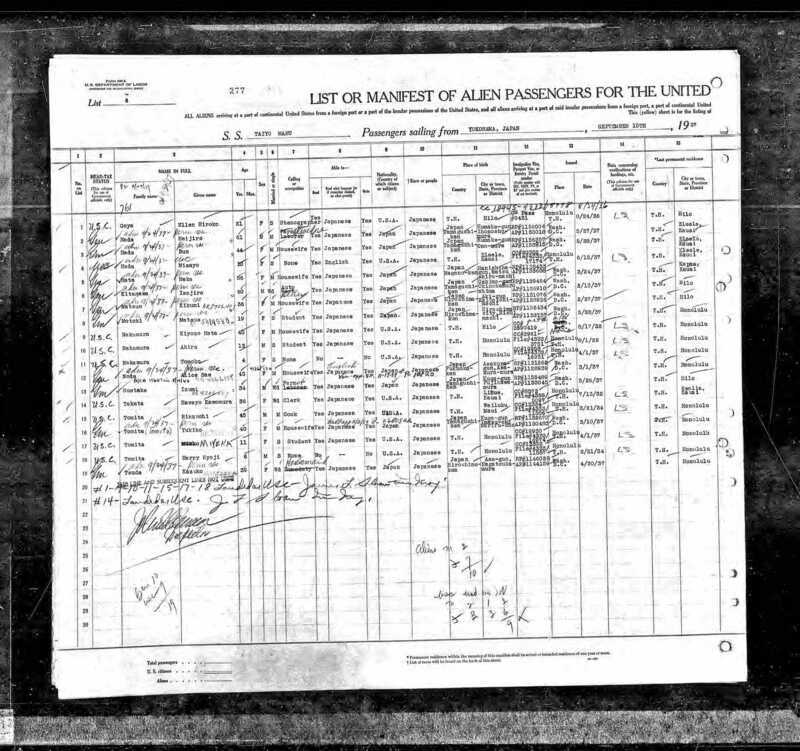 There is an American website that allows one to research old personal information, (www.ancestry.com) (fee applies) and I found Takata’s boarding record and appearance record. I am almost certain that the person listed is herself since her age is written down. It seems that there was no one else with the same first and last name. Hawayo Takata’s birthday is December 24th. There is some information about her family, but I decided not to include it here. 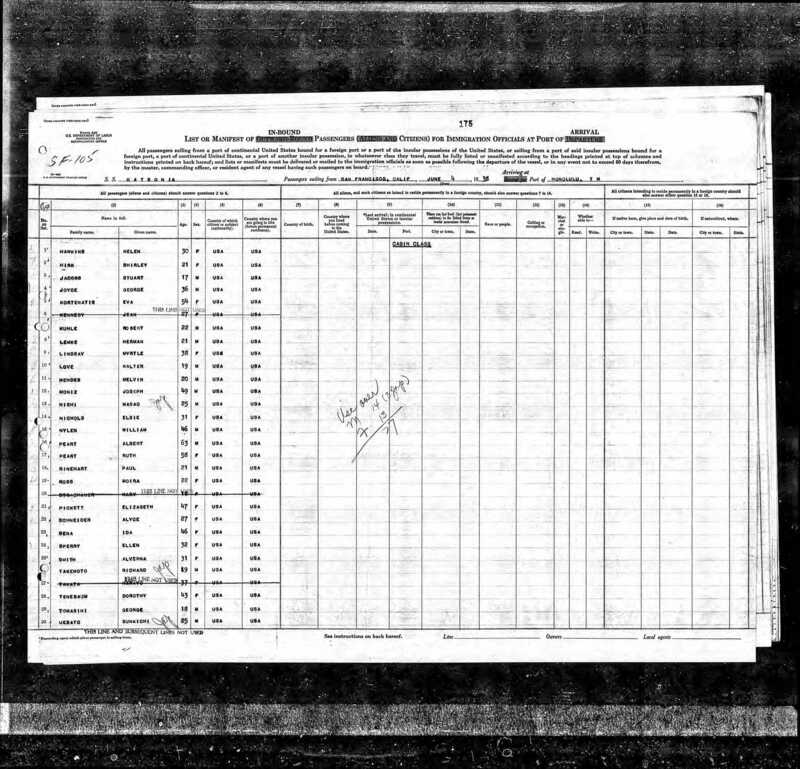 The address as of 1930 was "Kawaiahau, Kauai, Hawaii Territory” on Kauai Island. 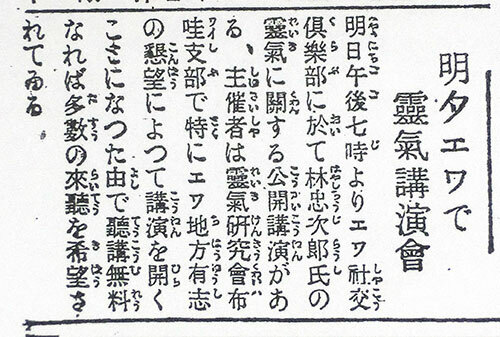 It is written that her husband was six years older than her and his name was “Saichi” and they had two daughters. She passed away in Iowa State in the USA. 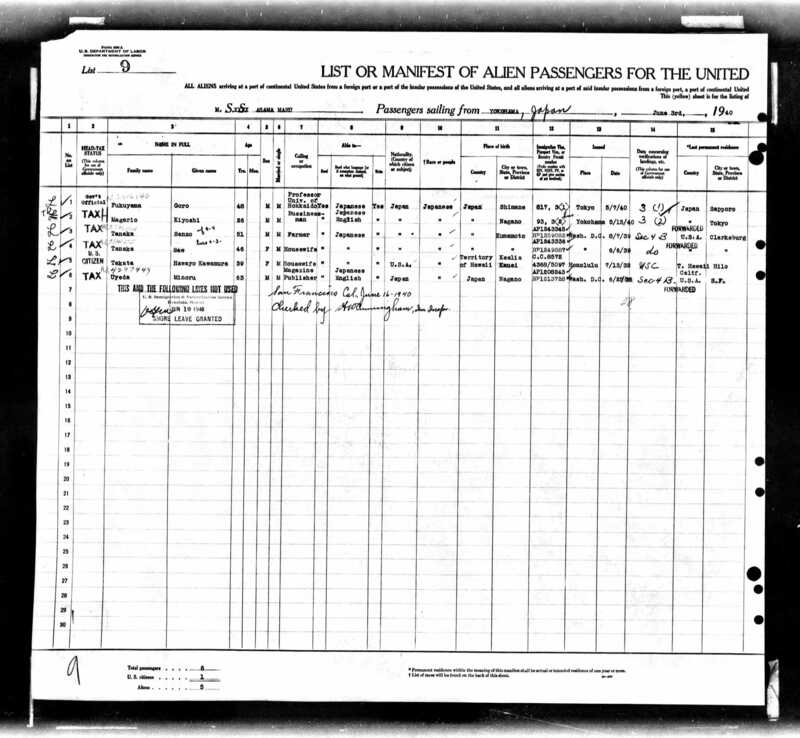 I think that you noticed that there is no big difference with the travel records known until now. You can see that she had traveled abroad many more times than we thought. The reason why she had traveled to Japan with her husband in 1929 might be because it was something related to her family events. Traveling in 1940 should be related to master Hayashi’s death (you can see she had stopped at West Coast on her way back). 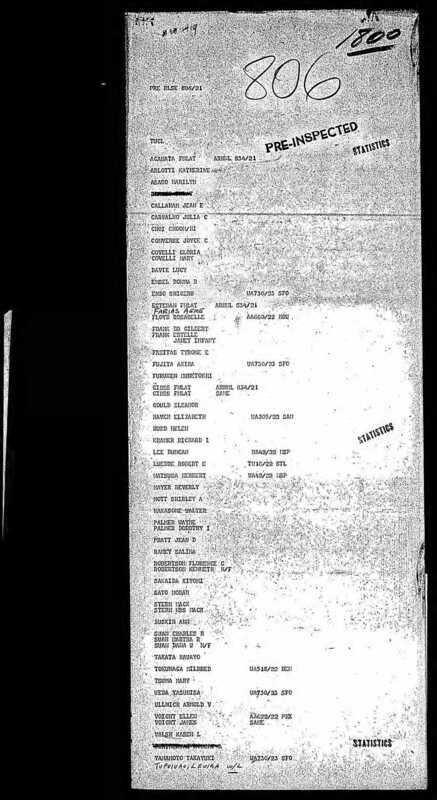 According to the books that were published by Takata’s direct students,（Helen Haberly[p39], Fran Brown[p59]) it is written that she traveled in April and master Hayashi passed away on May 11th (Notice of his death in Tokyo-asahi Newspaper), thus their information is consistent with these travel records. It must have been either 1954 or 1955 when she met Hayashi after the war. On a trip to Guam in 1957 she was accompanied by Doris Duke, the daughter of a wealthy family, and I would say that they had already known each other since around this time. “In the winter three years ago, she studied this technique enthusiastically for about half a year at my treatment centre in Tokyo and started to offer treatments and teach after she returned to Kauai Island on July 2 Years ago….”. It perfectly matches with the travel record. 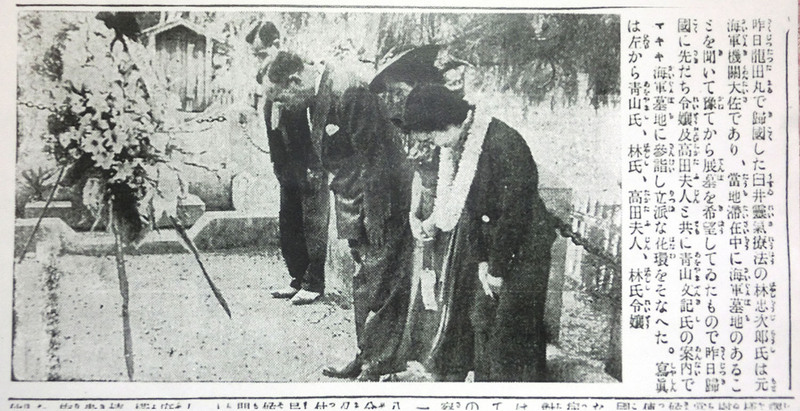 Takata’s re-visit to Japan in 1937 was the reason why master Hayashi ended up visiting Hawaii. It is unclear if she had re-visited Japan only because she wanted to meet Hayashi or not. I will mention it in details later, but Takata had already started to teach Reiki soon after she returned to Hawaii after her first visit to Japan. Perhaps, I think she had received a Shihan-kaku teacher’s certification at the time of her first visit to Japan in June 1936. Then, she must have visited Japan again next year because she wanted to be a Shihan teacher. Otherwise, there would be no reason to go back all the way to Japan from Hawaii. 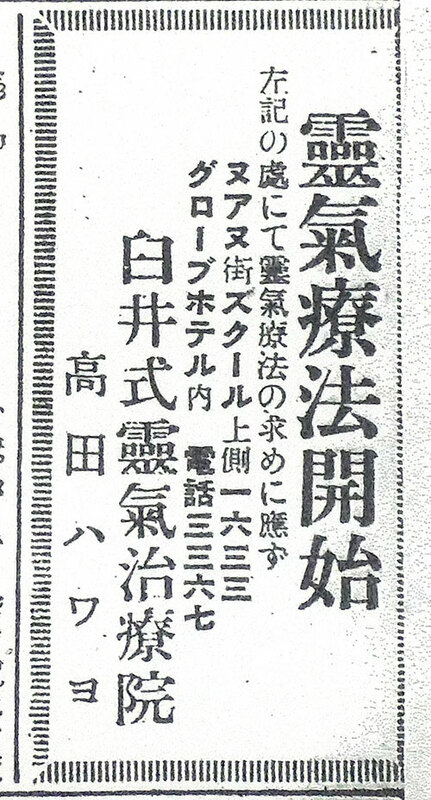 Thus I speculate that she had been certified as a Shihan teacher just before master Hayashi went back to Japan. When you hear “The history of Hawaii and Japan”, almost 100% of Japanese will think of the Pearl Harbour attack. In fact, there is a deep and old relationship between Japan and Hawaii. Unfortunately, Hawaii as a small country was dominated by other cultures throughout its history. Kamehameha-I established the kingdom of Hawaii in 1795. After its establishment, various countries tried to exert their influence by sending missionaries and immigrants. America (1820) - sent missionaries, China (1802) - sent immigrants, UK (1843) - declared sovereignty over Hawaii, France (1849) - declared sovereignty over Hawaii. 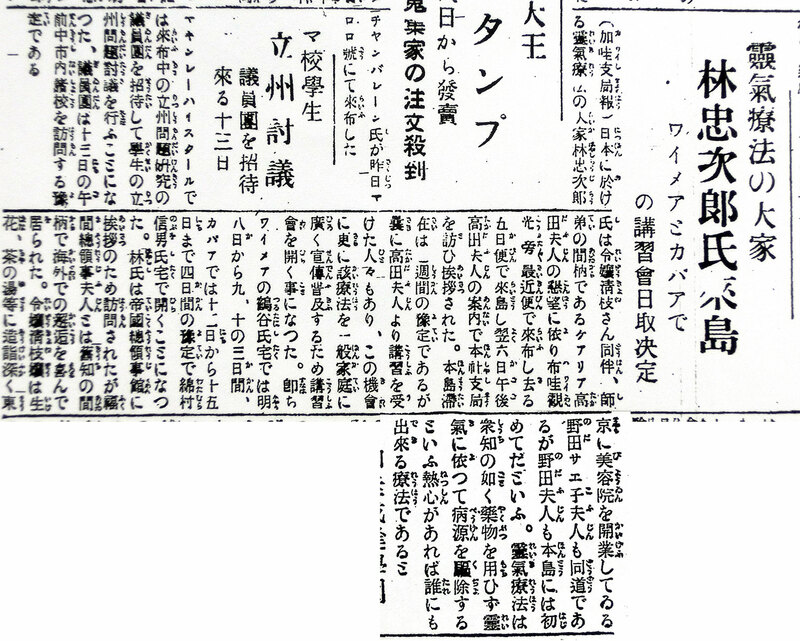 The controversy became intense when Japanese also fight over Hawaii. In 1881, King Kalakaua visited Japan, met with Meiji Emperor and an immigration agreement was signed. 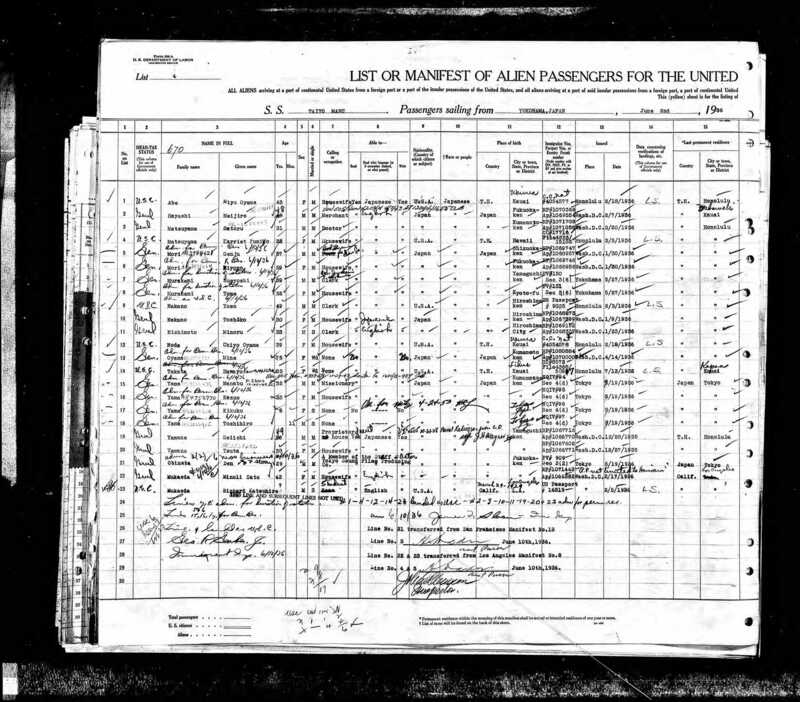 The Japanese Government mediated immigrants started to move to Hawaii starting in 1885. However, in 1893, American farmers in Hawaii raised a coup d’etat with a support of 160 marines and overthrew the King Kalakaua. Since then, the influence of the United States was strengthened and in 1898 Hawaii became the territory of the United States of America (Territory of Hawaii). 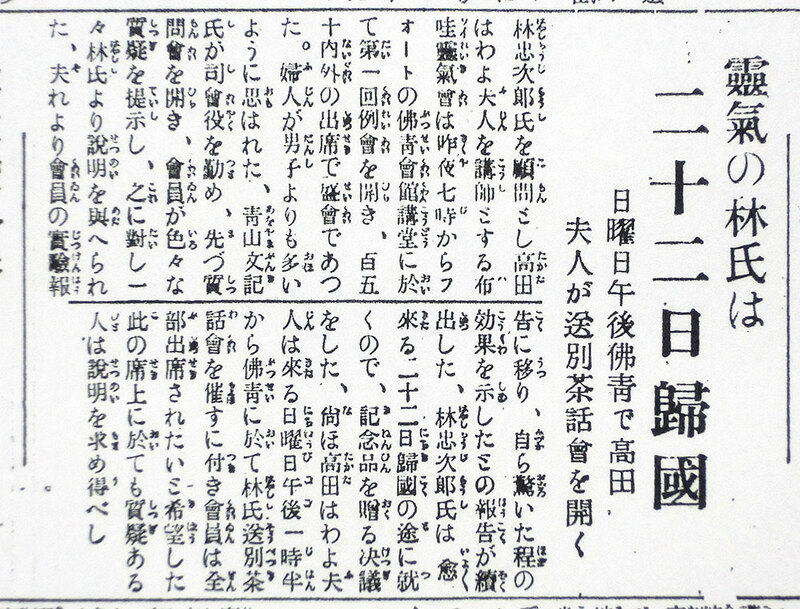 In this era (around 1930s~1940s), newspapers were filled with many articles about the Second Sino-Japanese war. The Japanese army continued to intrude into territorial of China. The collapse of Nanjing 南京 (photo →) and the collapse of Qingdao (青島) were reported extensively. (Please note that I am not justifying those actions. I want readers to know what was going on at that time.) This was the moment when Japan took a decisive path toward the Pacific War. It was like the gears were moving forward one by one without turning back. There were already many victims in China, but since then, 3 million Japanese people would die by the time the war had ended. In late 1930th, many people spent every day without knowing what was really going to happen. 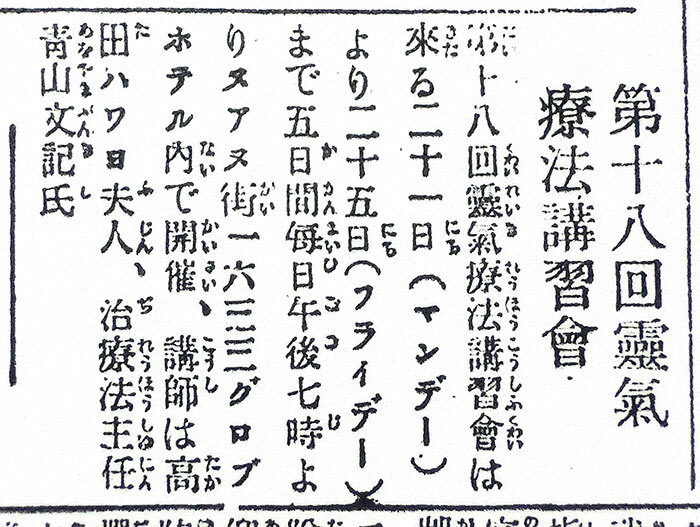 Back then, Hawaii was written as “布哇” in Kanji instead of “ハワイ” in Katakana which is the modern inscription. Besides this, Kauai, the island located to the northwest, was written as “加哇” in Kanji, and Maui, the island located between Oahu (with Honolulu) and Hawaii on the southeast, was written as “馬哇” in Kanji. (Please visit here for the image) ***Writing these city names in Kanji represents the old era. 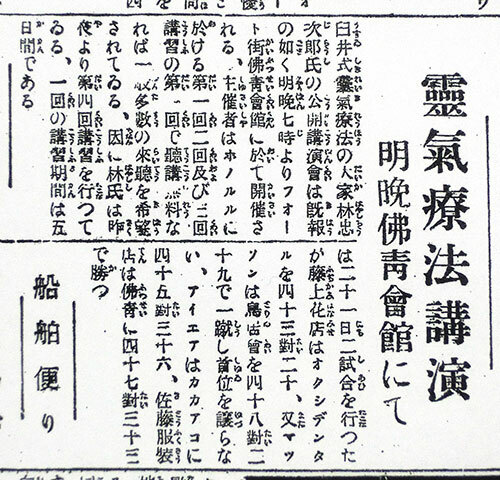 Hawaii Hochi (Back then, written as 布哇報知) is an existing newspaper that was established in 1912 (45th year of the Meiji era, 1st year of Taisho era). It is a surprisingly old establishment. It is located in Honolulu, and the building location was on Queen Street when it was established first. 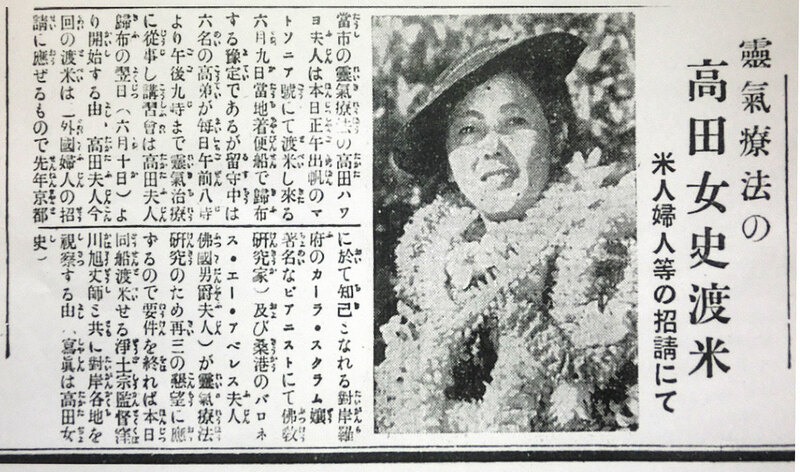 They changed the name of the newspaper as “Hawaii Herald (written all in katakana)” during the World War II, but the name was switched back to “Hawaii Hochi (written all in kanji) in 1952. I imagine it was an extremely important source of information for Japanese in Hawaii, far away from Japan. *** Non-Japanese words are usually written in Katakana. 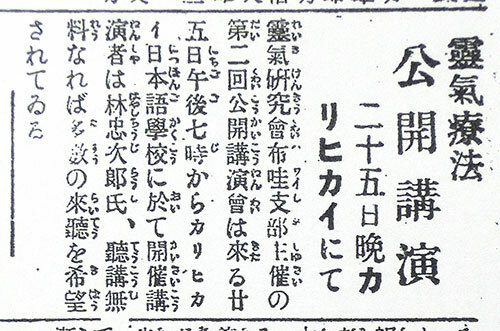 In the newspaper, there were many articles about the arrivals and the departures of ships from/to Japan. Nippon Yusen owned 3 ships, the Asama Maru, Chichibu Maru (photo →) and Tatsuta Maru. The major ports of call seemed to be Hong Kong, Shanghai, Kobe, Yokohama, Honolulu, Los Angeles and San Francisco. Back then when those ships were commonly used to travel between Japan and other countries, it took about one week to sail between Yokohama and Honolulu. However, once the War broke out, these types of private ships were forced to serve as transports by the Japanese Navy, and were all sunk by US torpedoes. Chichibu Maru was sunk in 1943 April (of about 2500 on board, 465 people survived), Tatsuta Maru was sunk in February the same year (all 1481 people on board died) and Asama Maru was sunk in November, 1944 (more than 500 people died). In case you don't know, the Japanese language is written vertically from top to button, and columns run from right to left. The example shown on right is the advertisement Ms. Takata put on Hawaii Hochi. 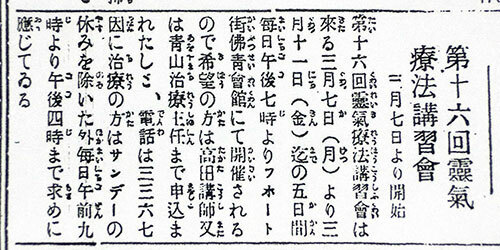 The title of article is "靈氣療法開始" vertically on the right where 靈氣 means Reiki, 療法 treatment, and 開始 beginning. Takata's name "高田ハワヨ" is on the left at the end. In another page, please allow me to explain the Japanese teaching system for those who are not familiar with it and to discuss how Takata became a Reiki teacher. Please read this page. 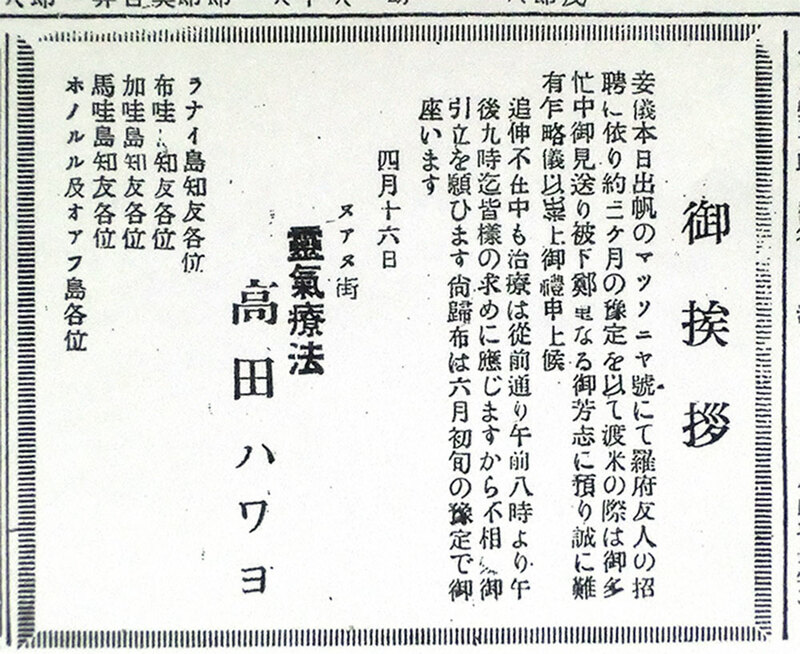 ● The important point here is that there were people who had already learned Reiki in May the 8th year in Showa era (1933) existed in Hilo (on Hawaii Island). I wonder if master Hayashi actually knew this information before? 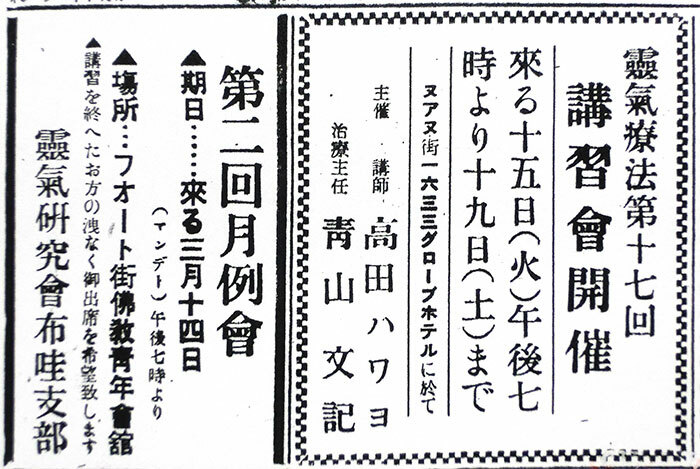 I found some documents detailing the career of a pastor, Kan Higuchi（Document 1，Document 2, Document 3), but there was no story relating to Reiki. However, Rev. 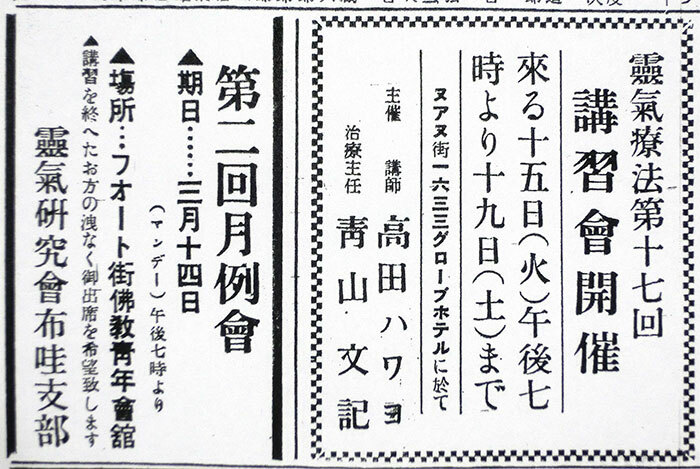 Higuchi died on October the 8th year of Showa era (1933), so it seems that he learned Reiki just before he passed away. I couldn’t find any information online about Mr. Chusuke Tahara, the Japanese language school principal. ● The article is misleading in that suggests Ms.Takata had been receiving a distance education and went to Japan this year for the first time. But I think this is a misunderstanding as I mentioned in the first place. 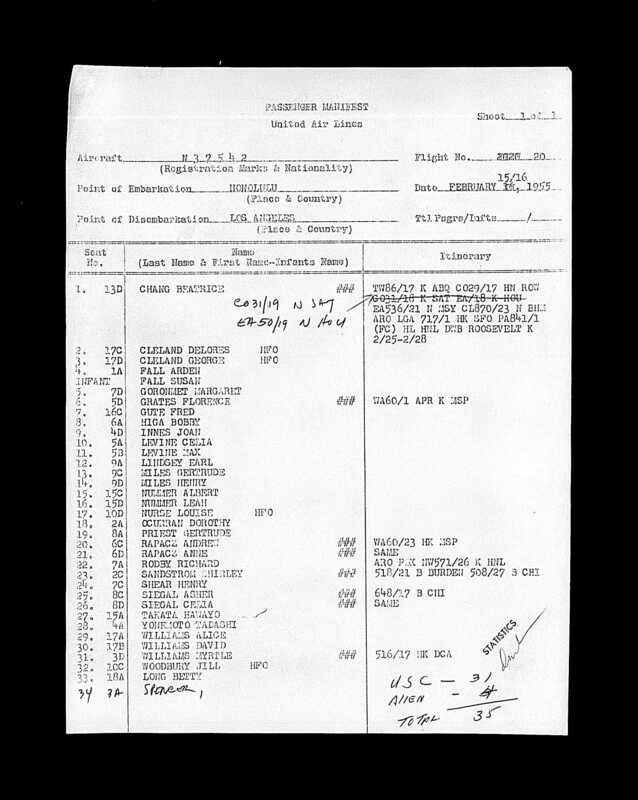 It is obvious that Takata went to Japan and stayed there in 1935 if you look at her boarding record and master Hayashi’s farewell broadcast as written above. 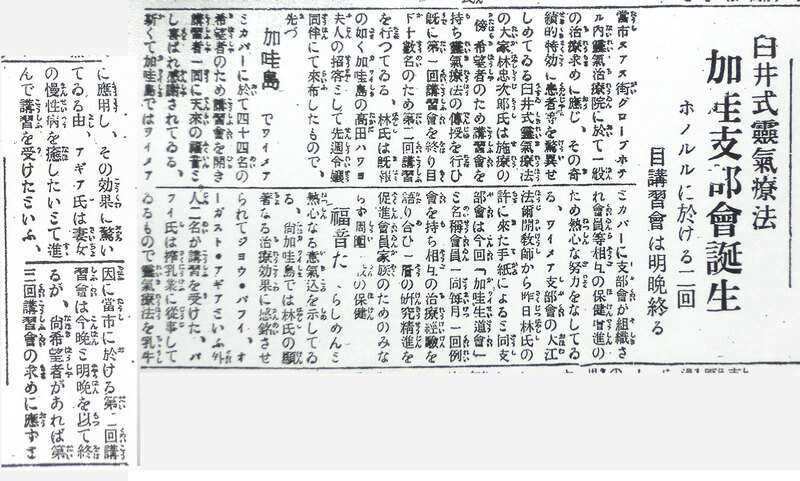 In the farewell broadcast that is written about Takata’s visit to Japan in July the same year, it says “In July last year (1937), she came to visit my home suddenly...”. There might have been some communication by letters between Takata and master Hayashi between 1936 and 1937, but I imagine that it would not be intended to be as part of a distant education. As it written above, Takata had already started teaching Reiki since she returned to Hawaii in 1936, thus I do not think that she had been in need of “continuous education” by distance. ● Ms.Takata’s name: Takata’s first name is written as “Hiromi”. 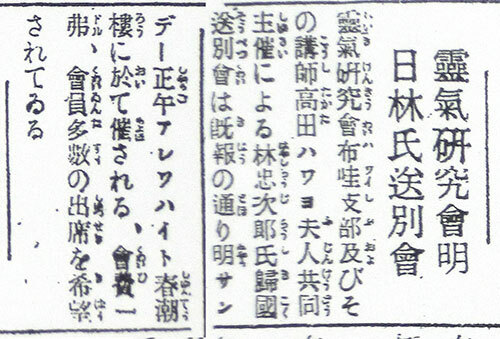 In fact, it is also written as Hiromi in the next article that was issued on October 2nd (Saturday). 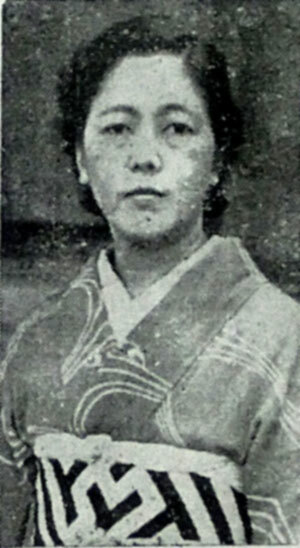 Ms.Takata's full name before marriage was "Hawayo Hiromi Kawamura", where Hawayo is an American name and Hiromi was a Japanese name. (Thanks to Justin Stein to clarify this) So, this article used her Japanese name. 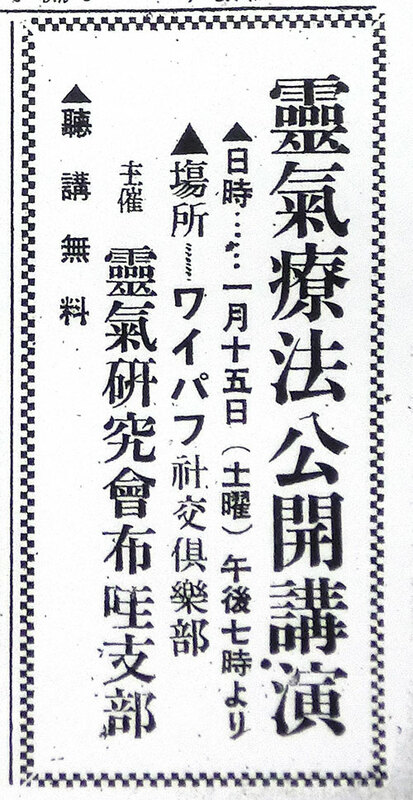 It is written as “Hatsuyo” in the advertisement on October 27th. As you read the series of articles, you may find that there are many misspellings of people’s names in Hawaii Hochi. ● Ms. Saeko Noda: Ms. Saeko Noda, who accompanied him, is not a person related to Reiki, but rather seems to have a relationship with his daughter. 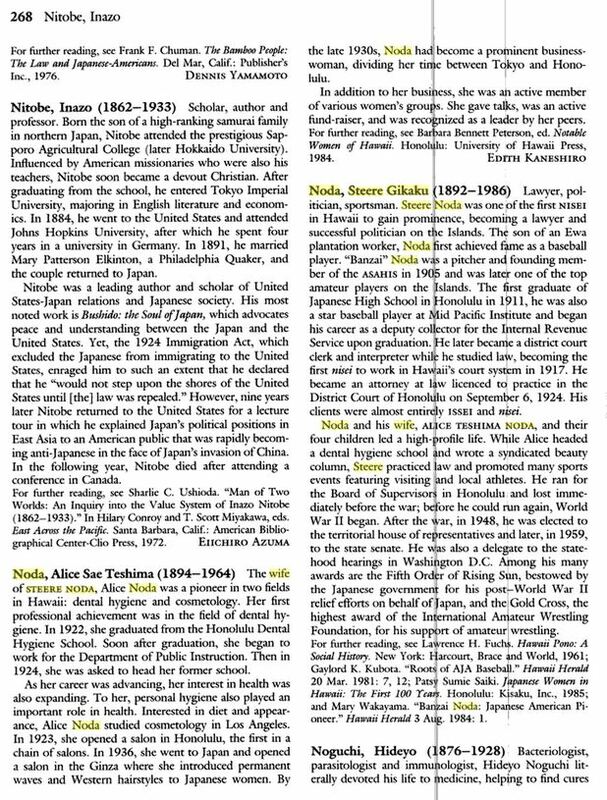 About her husband, Mr. Gikaku Noda, he seems to be the same person, "Steere Gikaku Noda" (1892–1986), who created a baseball team called “Asahi ball club” in Hawaii in 1905. 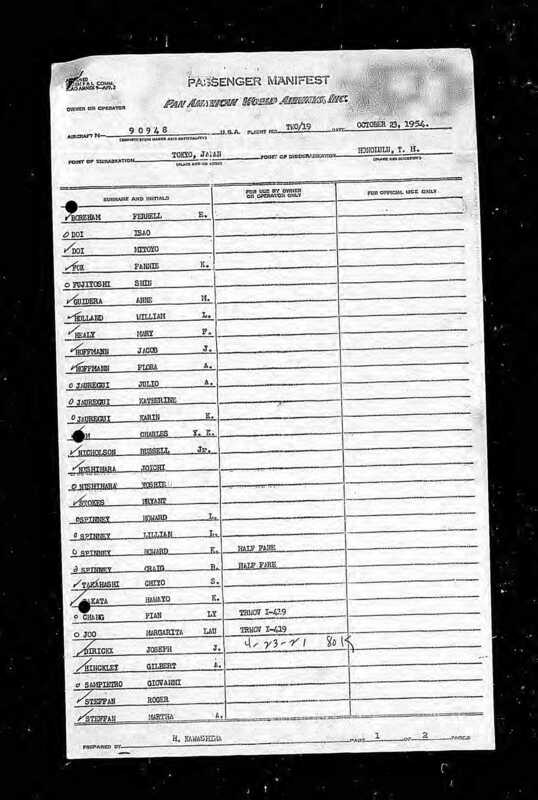 In this document, his wife’s name is written as “Alice Sae Teshima" (1894-1964), so there is a strong possibility that this is correct. 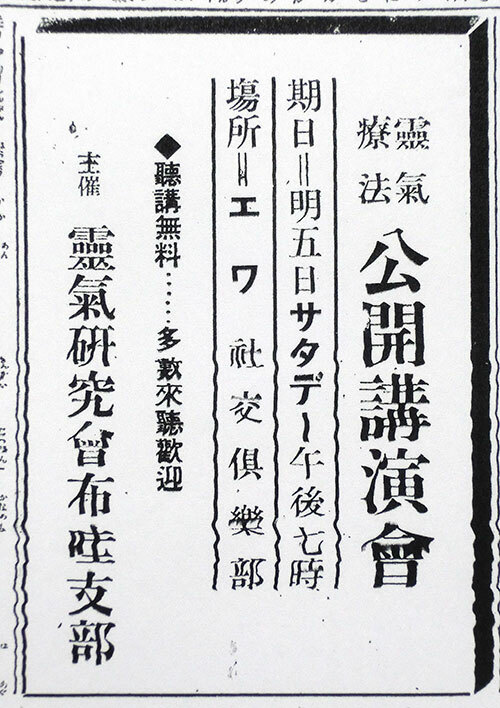 According to this information, it is written that Ms. Noda had opened a hair salon in Ginza in 1936 which actually coincides with the contents of a newspaper article that will appear later. Thus I am quite confident that all this information is correct. It is easier to track down information about Reiki in those days if the related people were well known. I think it may be possible to track down more information about Mr. and Ms. Noda. 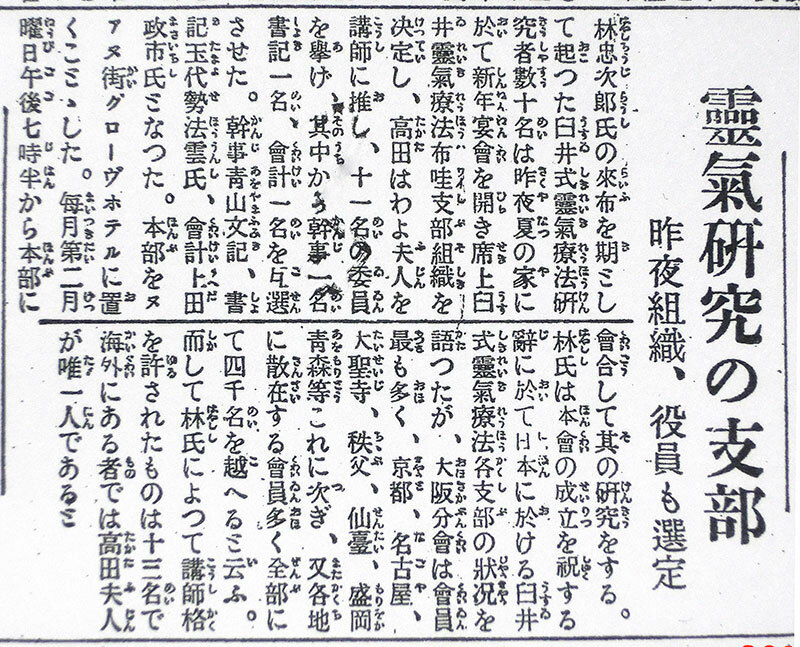 ● Naval doctor： Master Hayashi is introduced as a Naval doctor in this article, but there is no clear evidence found to this day that shows he was a naval doctor. 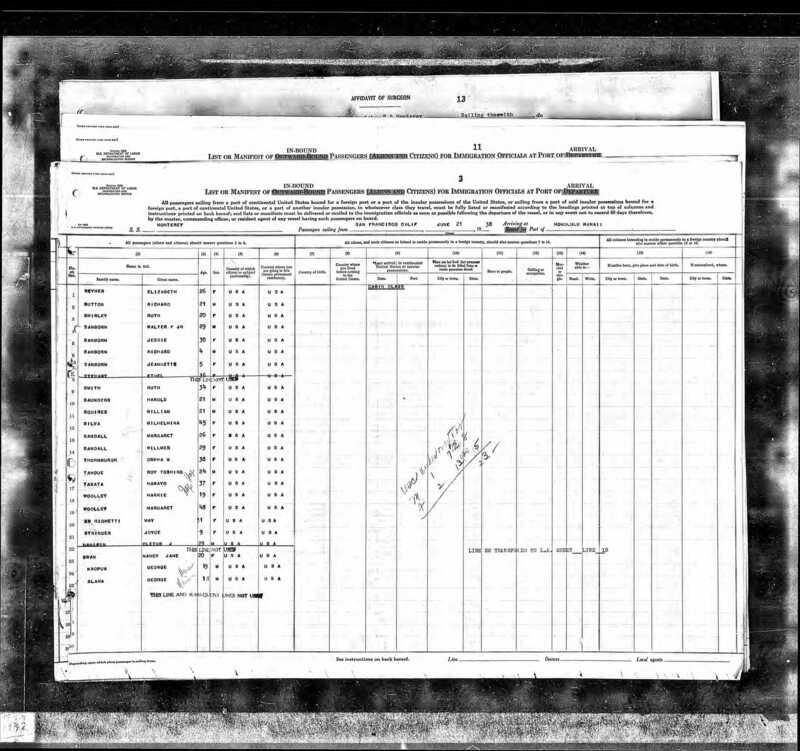 The only clue is the official pre-war tax record showing that he paid tax as a “doctor”. ● Ms. Takata’s name: Takata’s first name is written as “Hiromi” in this article as well. ● Hayashi’s boarding records shows “Master of Hayashi Reiki Kenkyu” as his occupation with the additional hand written comment “Spiritual Healer”. 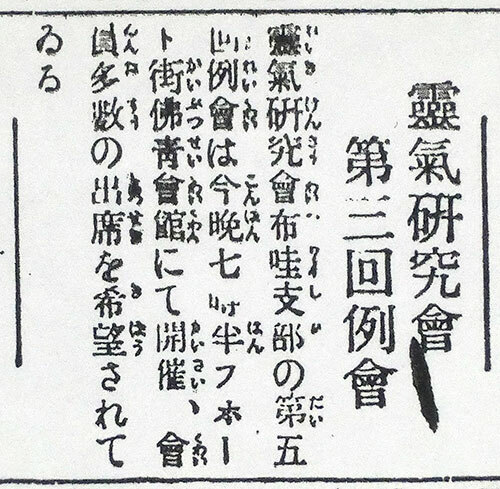 The age of his daughter, Kiyoe, is shown as 28 years old. (Kauai Branch Office Report) Mr. Chujiro Hayashi, a master of Reiki Ryoho in Japan, accompanied his daughter, Kiyoe, arrived in Hawaii partly for a sightseeing on the recent ship at the strong request of his disciple Ms. Takata. On the 5th they arrived in Kauai Island and on the next day, the 6th, Ms. Kealia Takata guided them to visit the head office in the afternoon for greeting. The plan is to stay on this island for one week, but they decided to hold seminars to promote and spread this treatment technique further to the general household since there were people who had taken seminars from Ms. Takata previously. Thus, seminars will be held at the house of Mr. Tsurutani of Waimea [probably not on Hawaii Island but on Kauai Island] for 3 days from the 8th tomorrow, 9th and 10th, and at the house of Mr. Nobuo Watamura of Kapaa for 4 days from the 12th to 15th. Mr. Hayashi visited the Empire Consulate General for greeting and was pleased to re-unite with a wife of the Consul General, Mrs. Fukuma, his old acquaintance. His daughter, Kiyoe, has expert knowledge of ikebana and cha-no-yu. Mrs. Saeko Noda, who owns a hair salon in Tokyo, accompanies her, although Mrs. Noda says it is her first visit Kauai Island. As it is well known by now, it is said that Reiki Ryoho eliminates the root cause of disease by Reiki without using medication and it is a therapy that anyone can do if one is eager. ● Itinerary: After he arrived in Honolulu on October 2nd (Saturday), he had moved to Kauai Island where Ms. Takata’s house is located. Miss. Kiyoe and Ms. Noda also went together. This Waimea is not the one on Hawaii Island as a tourist site known now, but I can guess it was the one on the southwest coast of Kauai Island. ● Later on, he returned to Honolulu and held seminars, but it was a 5 days seminar then. However, the seminar here on Kauai Island was shorter taking 3 or 4 days. More is unknown about this seminar but it is possible that the date was shortened similar to current Jikiden Reiki practices. ● Ms. Takata probably had held seminars on Kauai Island after returning to Hawaii, since it is written “there are people who had taken seminars from Takata previously”. This is consistent with the contents of the farewell broadcast of master Hayashi that will be introduced later. ● Consulate General: Surprisingly, I can not confirm the existence of a Consulate General on Kauai Island back then by checking online. I have not been able to track down any information about the wife of consulate, Mr. Sou Fukuma, an old acquaintance of master Hayashi. ● Ms. Takata’s name: In this article, it is written as “Ms. Kealia Takata”. But according to the later articles, it seems it was meant to be written as “Ms. Takata of Kealia”. There is an area called “Kealia” located just beside Kapaa where Takata actually lived. Master Hayashi held seminars in Kapaa on Kauai Island until the 15th, but I see that he moved to Honolulu on Oahu Island during this time. It is already reported that Mr. Chujiro Hayashi, a retired army doctor and captain and a well known master of Usui Shiki Reiki Ryoho is staying in Hawaii with his daughter. He will respond to the request for treatment at 1633 Nu’uanu Avenue at the Globe Hotel (former Mitamura Hospital) from today as there are quite a few people who wish to receive treatments since his arrival in Hawaii. Mr. Hayashi and his daughter came to Hawaii as guests of Ms. Hatsuyo Takata of Kealia, Kauai Island. Since Ms. Takata studied Reiki Ryoho under Mr. Hayashi and returned to Hawaii, she has obtained a business license from the head office and has been offering treatments, now out of her town helping Mr. Hayashi and his daughter. Mr. Hayashi is scheduled to stay in Hawaii for one month as he wishes to promote social welfare by holding Reiki Ryoho seminar if there are enough people who are interested in it. An ideal class size is between 5~6 people to 14~15 people as a group. As we reported before, there are quite a few people who studied this treatment technique under Mr. Hayashi, and those people have been offering treatments for their families and acquaintances and its good efficacy has been recognized. The phone numbers of the treatment place is 3367. 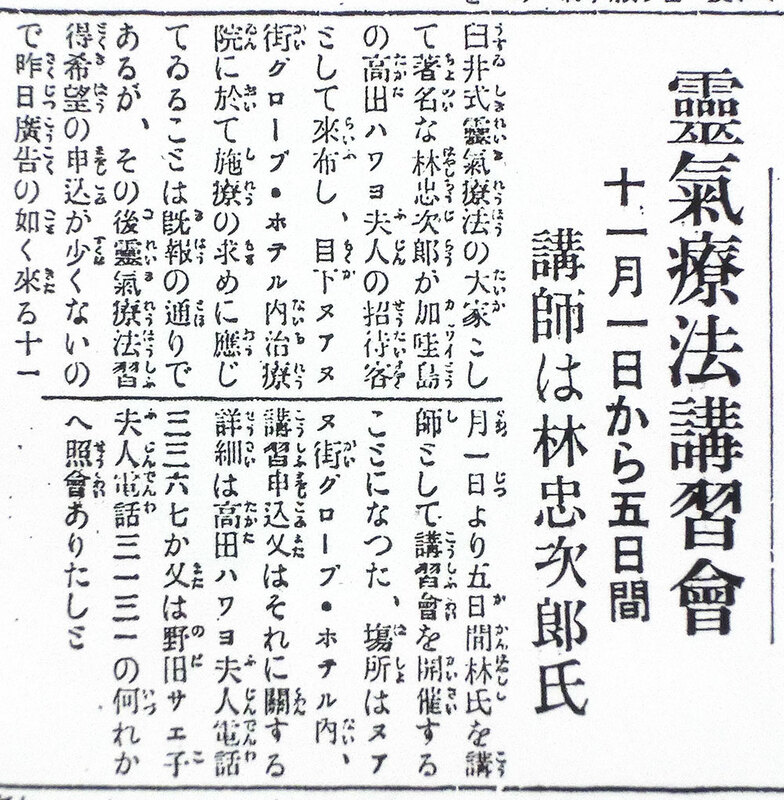 ● This article appeared in the same issue with Ms. Takata’s advertisement announcing the opening of her business. Her treatment work may not have been recognized until this time because it is specifically mentions that “business opening”, and “obtained a business license” in this article. ● Name and title： In this article, Ms. Takata’s first name is written as “Hatsuyo”, and Hayashi’s title is incorrectly written as an army captain. 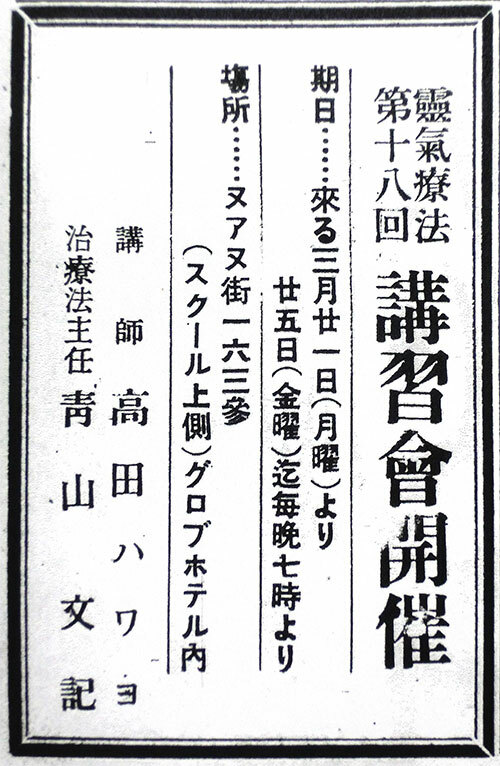 There is an advertisement in the same issue about the first seminar in Honolulu. "講習" means seminar. 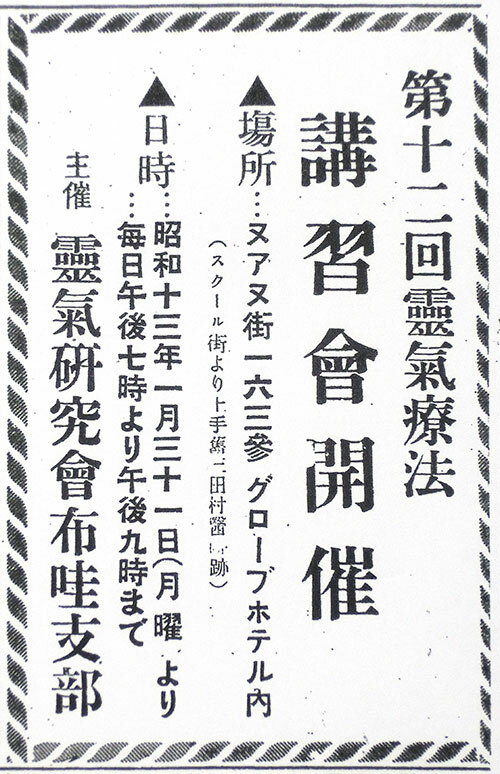 In this advertisement, Ms. Noda’s (野田サエ子 mentioned above) name is added as a registration contact. 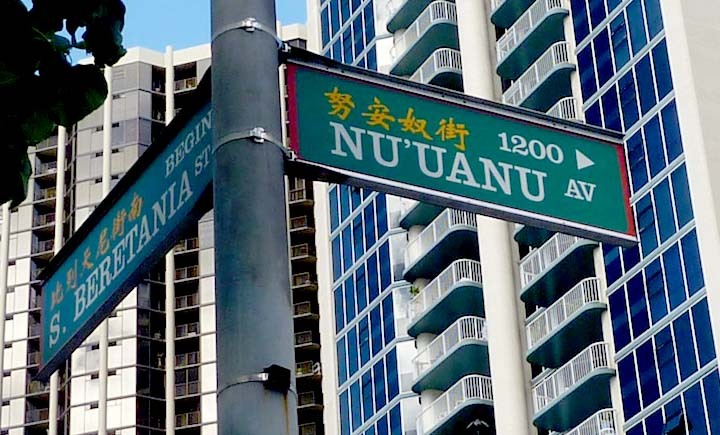 Fort Street is located one street away and close to Nu’uanu Avenue. 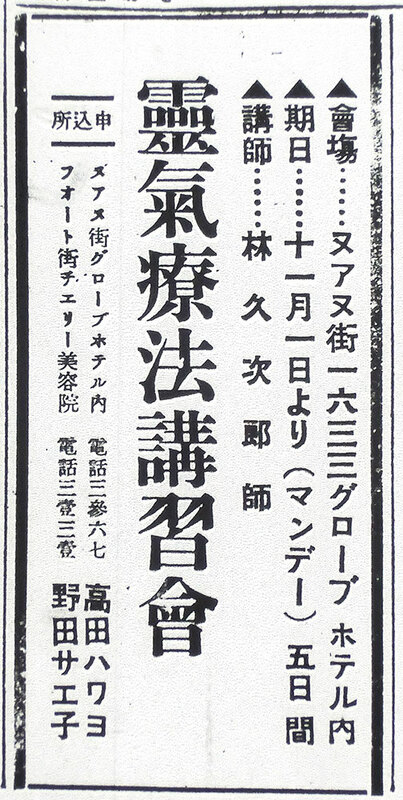 It is unclear about the hours for the seminar in this advertisement, but it seems like it was held in the evenings for 5 days according to later information. As we reported before, Mr. Chujiro Hayashi, a well known master of Usui Shiki Reiki Ryoho, came to Hawaii as a guest of Ms. Hawayo Takata of Kauai Island. He has been responding to requests for treatments at a clinic in Globe Hotel on Nu’uanu Avenue. We have decided to invite Mr. Hayashi as a teacher to hold 5 days of classes from this coming November 1st since there are quite a few people who wish to take the seminar in Reiki Ryoho. The location is at Globe Hotel on Nu’uanu Avenue. To register for the seminar or for more information, please contact either Mrs. Hawayo Takata at 3367 or Mrs. Saeko Noda at 3131. ● Specific schedule of the classes in Honolulu is written here. By looking at the word “5 days”, it seems to be a full Reiki seminar with Zenki・Kouki in five days, which is the same business-trip style seminars that master Hayashi offered previously in Japan. ● Finally, all the names are correctly written! ● Master Hayashi had started his 2nd (第二回) seminar on Monday immediately after he finished the 1st classes on November 5th　(Friday). As it is written “from tonight”, we can see originally the classes were held on weekday evenings from Monday to Friday. ● We can see there were two seminars held in Kauai, and there were 44 students. Already there were many people interested in learning Reiki. ● According to this article, it seems like that the Waimea branch existed at this time and yet the same branch was promoted to be a Kauai branch. 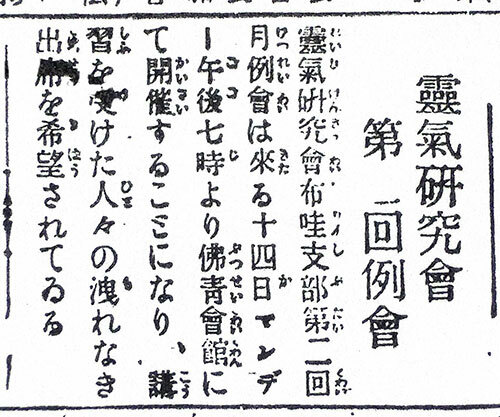 I haven’t been able to track down the Buddhist missionary “Houji Ooe”. 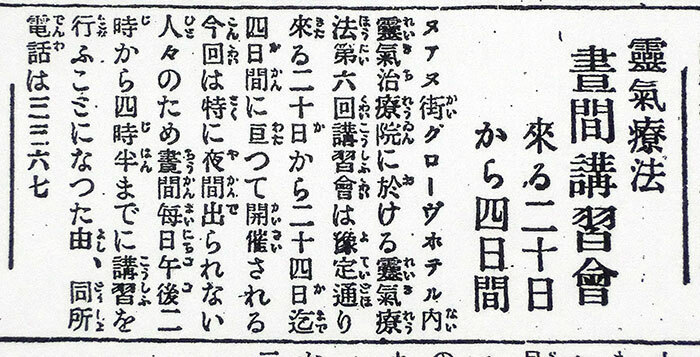 ● It is written that foreigners also took the classes, but I wonder if they understood Japanese? Was there an interpreter? It is very interesting to read a pre-war documents stating that there had been an example of applying Reiki for dairy cattle. 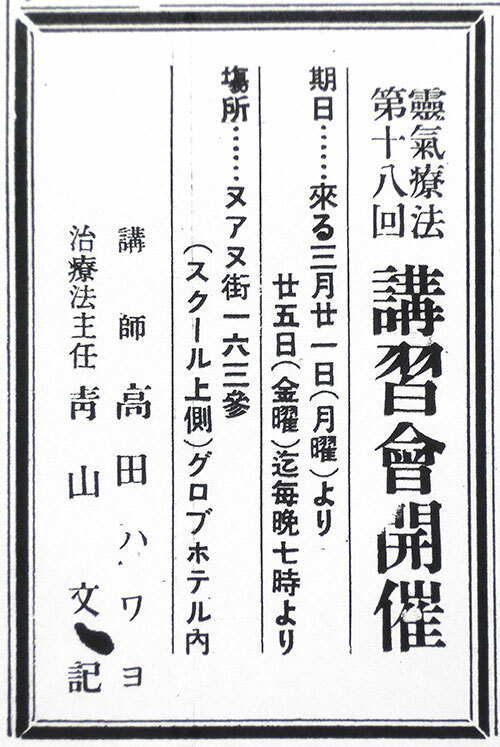 ● Separate from the seminars, he also held public lectures (講演会). 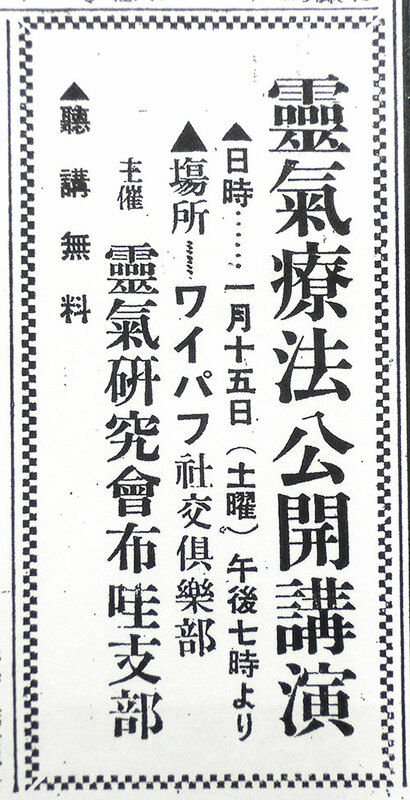 The lectures were open to the public for no cost (無料). 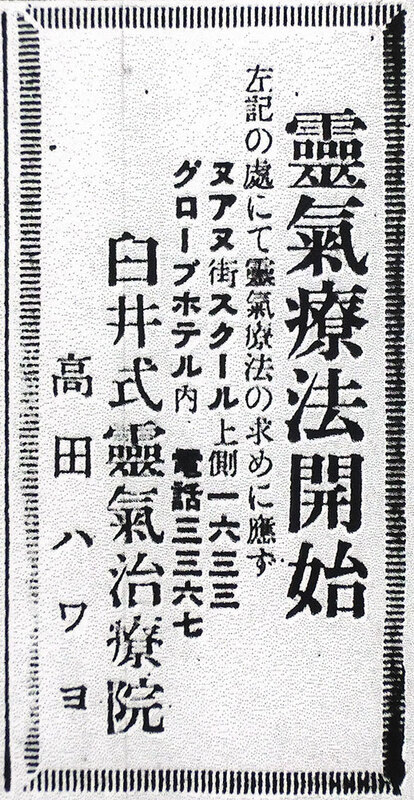 This indicates he was collecting a tuition fee for the seminar classes, but there was no clue about the tuition fee in the newspaper articles. ● Please note 講演會 means lecture, while 講習會 means seminar or class. Rather than being an explanation of Reiki, it is an advertisement. Surprisingly there is not much new information here. ● This article shows that in addition to the seminars, there were lectures open to the public. The location “Buddhist Youth Hall” is actually “仏教青年会館, Bukkyo Seinen Kaikan” as you will see in a photo later. As we reported previously, Mr. Hayashi, a master of Reiki Ryoho, gave a lecture at the Buddhist Youth Hall of Fort Avenue from 7pm on 24th, and despite the rain, more than 200 people attended and it was a great success. First of all, Mr. Houun Tamayose representing the organizer and as the chairperson introduced Ms. Hawayo Takata of Kapaa, Kauai. He spoke in detail about how Ms. Takata went to Tokyo with diseases requiring a surgery, such as kidneys and appendix. But after she had experienced a complete recovery with Reiki Ryoho and without surgery, she took lesson and returned to Hawaii. Since then she has devoted herself to treating illnesses in others on Kauai and has achieved much success. Following this, she invited master Hayashi to Hawaii. Next, Mr.Hayashi spoke about the career of master Mikao Usui, the founder of Reiki Ryoho, who had miraculously acquired “Reiki” after three weeks of fasting. Then he explained the general concept of Reiki Ryoho as it is neither a psychotherapy nor a prayer therapy, neither a magic nor fraud, but a very rational therapy that enables anyone to treat diseases fully once giving Reiki, even if one doesn't believe, disagree and are a skeptic. He explained these by introducing a numbers of cases for two hours. The meeting was ended soon after 10 o’clock with the audience showing their deep interest and completely fascinated with him. By the way, he has been staying at the Globe Hotel on Nu’uanu Ave and offering treatments every day from 8am to 4pm while holding the 4th seminar in the evenings. ● This is a report of the lecture on the 24th to an audience of 200 people. The chairperson at this lecture "Houun Tamayose" was a Buddhist monk at Higashi Hongan Temple. It seems that he was active in promoting Reiki in Hawaii. There is no doubt that he was an influential member as he would become a secretary of the Hawaii branch later on. 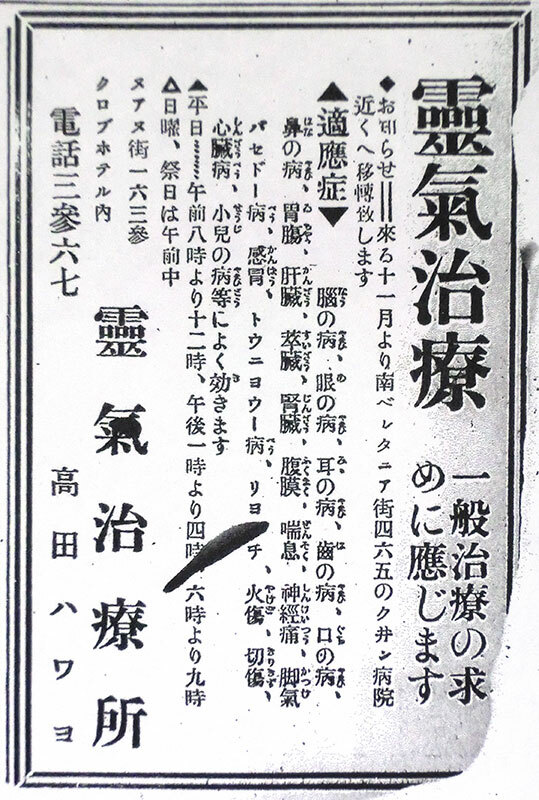 ● “青山分喜: Mr. Bunki Aoyama” was active as a chief therapist in later times, however, the correct kanji writing is “青山文記”. It seems that there are a very high percentage of misspelled names in this newspaper. ● ”Houun Tamayose” had appeared before. I haven’t done any research as yet on Mr. Hiroshi Morohashi, Mr. Masaichi Ueda, or Mr. Sentaro Ishii. 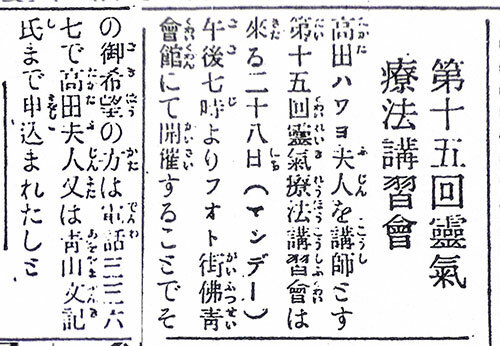 Mr. Masaichi Ueda’s name is written in a different kanji in a later article. Mr. Hiroshi Morohashi will appear in a later article regarding a farewell party on February 20th. It seems that he was a manager of Yokohama Shokin Bank Honolulu branch. ● The 6th seminar is written as ‘2pm to 4:30pm in the afternoon’, but it is written as 4 days seminar in the title. Wouldn’t it be 5 days seminar if the dates were 20th(Mon) to 24th(Fri)…? ● This is a testimonial from M.U, one of master Hayashi’s students, but this could be “Mr. Masaichi Ueda” mentioned in a previous article. This article contains a considerable amount of information. You can see that Mr. Katsuzo Nishi of the Nishi Shiki Kenko-ho (Nishi Style of Health Engineering) also came to Hawaii in 1936. 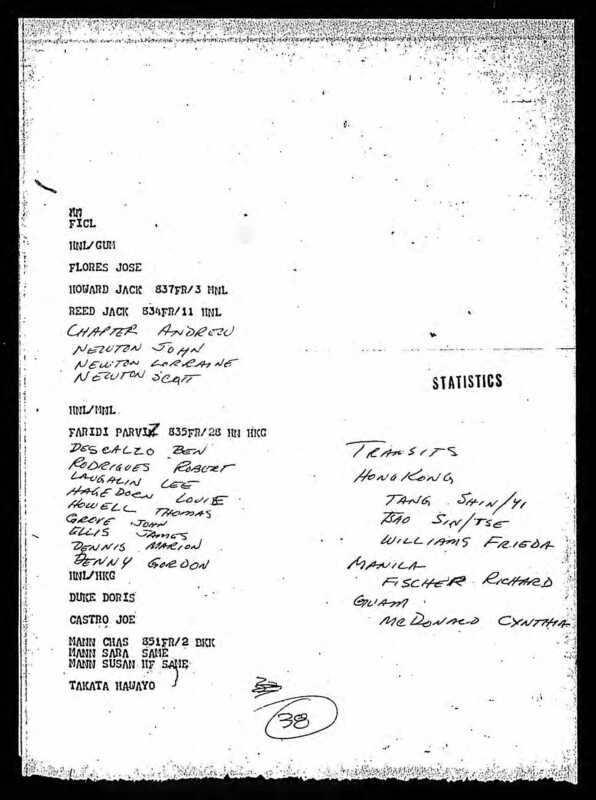 There is a possibility that the number was changed halfway through due to the two seminars held at the beginning on Kauai Island, but there is more likely that the number was miss-typed in the article of December 17th. ● Finally, the Hawaii branch is to be launched. The written dates are a bit confusing, as the 9th seminar will start at 7pm on January 10th, but would the new year's party and the branch launching meeting start at 6pm with a seminar to begin at 7pm on the same day? You will see a similar situation later, but It seems that the seminar dates were changed to Tuesday through Saturday in this case. 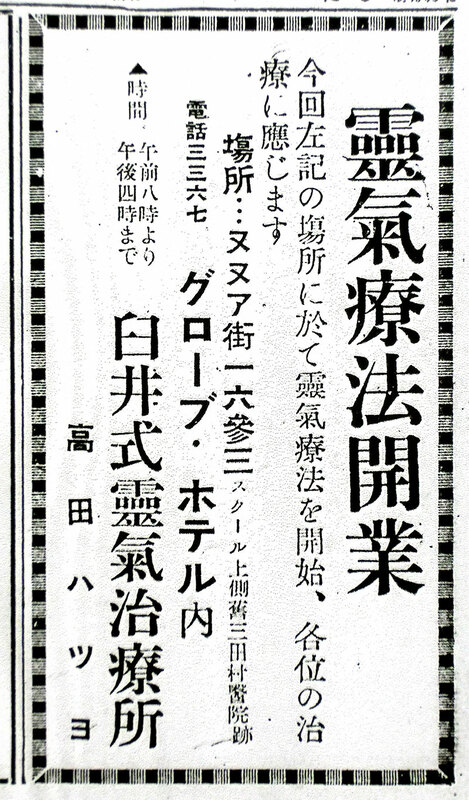 Contrary to the advertisement, the article says the seminar is on the11th (Tue), so I think the article is correct. ● “Natsuno Ya”: This is the venue where the New Year’s party was held. It still exists in Honolulu as the oldest high-class Japanese restaurant. You will see “Shun-chou-rou” referenced in a later article. It is confusing; these were two separate restaurants at that time, but now the historic　Shun-chou-rou is called Natsunoya. ● This lecture was held in Waipahu (ワイパフ) which is located close to Pearl Harbour. 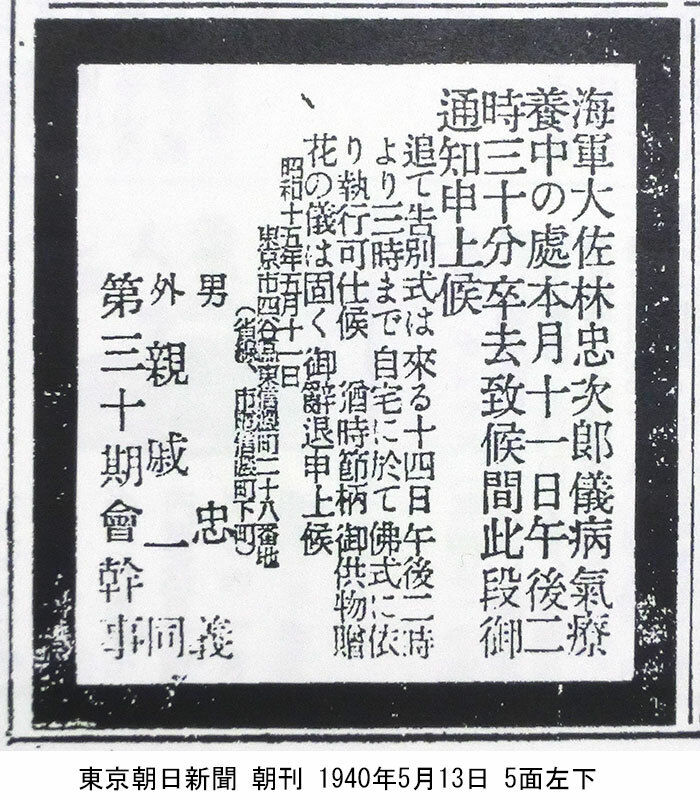 Again, the names are written using different kanji characters. 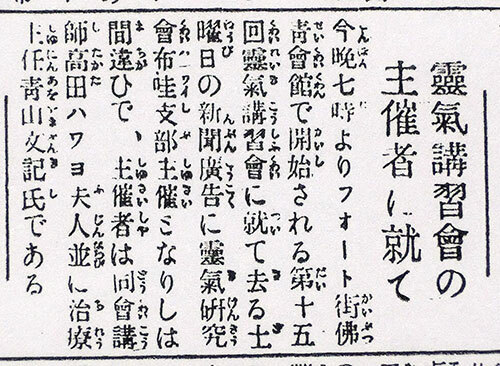 It was written as “植田政市” for Masaichi Ueda in the previous article, but it is written as “上田政市” in this article. 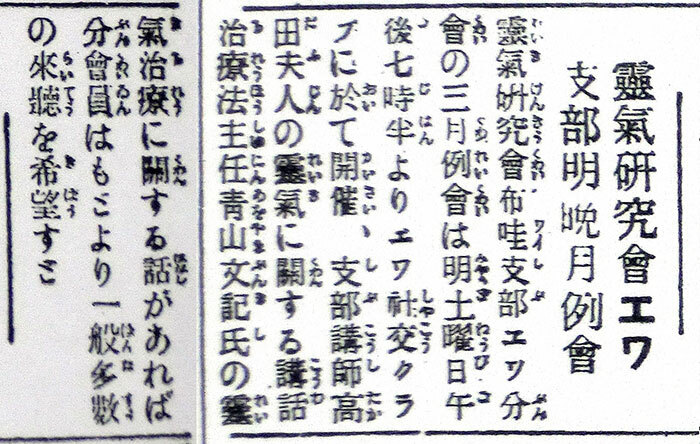 I am not sure which is correct, but it appears with “上田” only once in this article, so probably “植田” is the correct kanji form. Daishoji (大聖寺), where Yamaguchis' were members is written as one of the branch names. Daishoji seems to be a special branch because it is a small town compared to others. Its surprising to see that there was a branch in Chichibu (west of Tokyo). ● Number of members： It is written as “About 5,000 members” in the article with master Hayashi’s farewell address, but it is written as “more than 4,000 members” in this article. 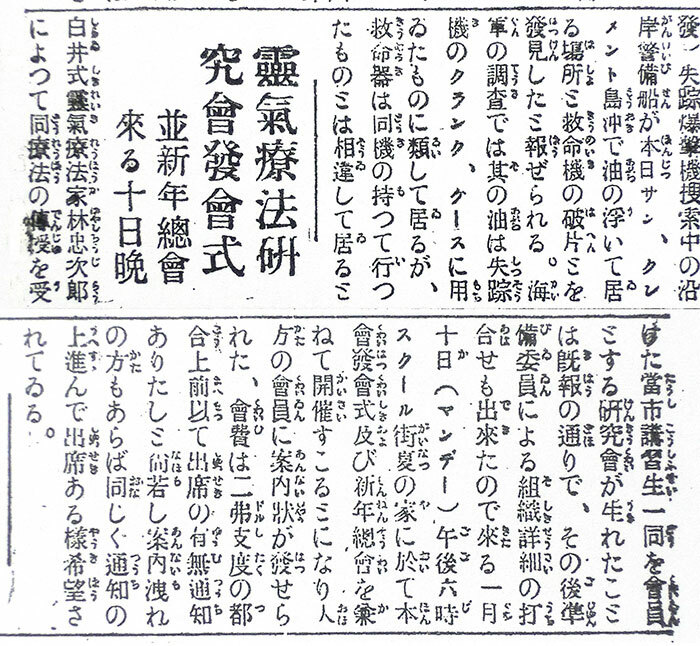 Also, it states that there are 13 Shihans including Ms. Takata, so this is consistent with Hayashi’s farewell address. ● This article is mainly about the group of Nishi Shiki Kenko-ho (Nishi Style of Health Engineering), but some things about Reiki Ryoho is also appear here. The article says they use their own “Hands on therapy”, which I am still researching. Kalihi Kai (カリヒカイ) is a name of the place located northwest from Kalihi area in Honolulu. 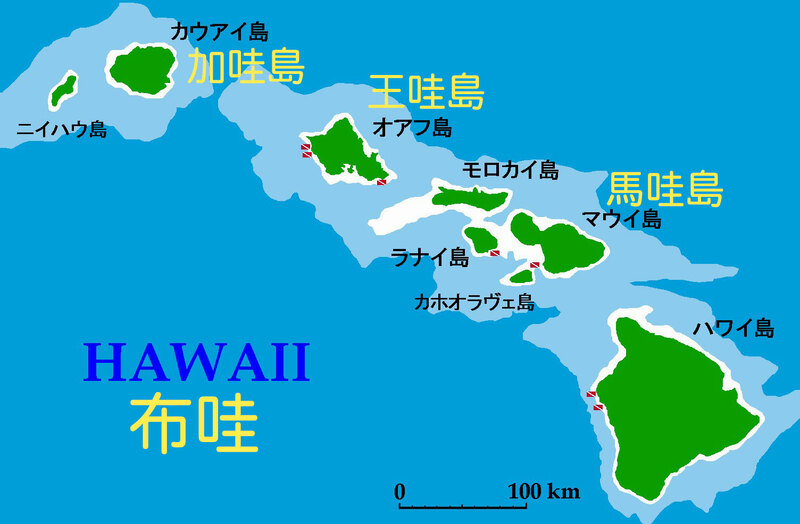 ● ”Ewa (エワ)” is located farther West of Pearl Harbour. The locations for the public lectures are spreading farther away from downtown Honolulu! Gradually, Reiki is beginning to be known in suburban areas as well. ● At last, a hair salon began to provide Reiki treatments. I sometimes see similar things happening nowadays, but I am sure it was the very first time anywhere in the world for Reiki to be provided in a hair salon. It is a quite a big deal to renovate and to separate the men’s and women’s sections. I wonder if Ms. Saeko Noda was giving treatments, or perhaps there were multiple therapists since it says there were two locations. ● I want to point out the important expression here. “People, who have taken the seminar but have not yet joined the membership after the Hawaii branch opened, also are likewise hoping to attend the regular meeting.” In other words, there is a difference between “taking a seminar” and “becoming a member”. At least I can say that the number of students is larger than the number of members. At least, it seems reasonable that the number of students is almost equal to the number of members. ● It is magnificent that more than 200 people attended the farewell party! I saw this photo for the first time this time here. It looks like the mens were wearing suits and most of the women were wearing kimonos. It seems exactly like how a present-day banquet would look. 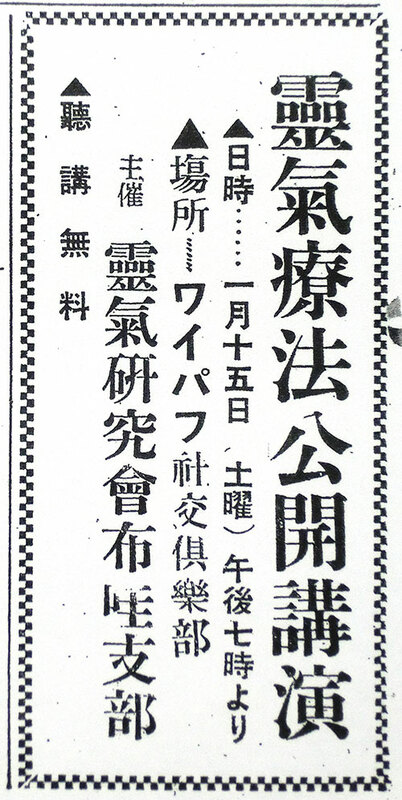 ”Shokin (正金)” probably means "Yokohama Specie Bank" that was located in Honolulu. It seems like that this building exists now as an historic site. ● Haleiwa (ハレイワ) branch is established with 23 members. It seems that Haleiwa is located in Oahu on on the side opposite of Honolulu. ● A picture when visiting Makiki (マキキ) Navy Cemetery is posted on February 23rd issue. Master Hayashi’s farewell words are the most important part of the series of Hawaii Hochi articles. Newspaper articles are often separated from the truth and may contain misunderstandings and distortions by the reporters. However, I think this article with his farewell words is likely quite accurate since it was copied directly from the Japanese broadcast. “I appreciate everyone’s kindness from the bottom of my heart.” - Mr. Hayashi’s farewell broadcast. The following is the farewell speech of Mr. Chujiro Hayashi of Usui Reiki Ryoho on his returning to Japan, broadcasted on Sunday morning on KGMB station. As introduced, I am Chujiro Hayashi of Usui Reiki Ryoho. I have been staying in this city since last October but now I would like to give my remarks since I will be going back to Japan on the Tatsuta-Maru that will depart on the 22nd, the day after tomorrow. Reiki Ryoho is a method of treating diseases and dispositions not only of our own bodies but also of other people's with no effort but just with the energy of Reiki which flows naturally from the body of a person. It doesn’t require difficult training, but just by attending the seminar for about three hours every day for 5 or 6 days and you will be able to show surprising results, even from the first day. Regardless of whether you are a man or woman, anyone can to do it easily provided if you are over 12 or 13 of age. 350 people became members in the Hawaiian Islands, including Caucasians, Hawaiians, and Chinese who don’t understand Japanese at all. However, all of them understood the seminar very well and are very happy to be able to treat various diseases. I feel deep regret that I wasn’t able to share this joy with those who live on the islands of Hawaii and Maui. There are about 5,000 members in Japan. Out of these members, I have approved 13 people as suitable teachers of this treatment technique. Ms. Hawayo Takata of this city is one of them, and she is the only one person who can teach this technique in Hawaii and throughout America. There is no one else. If you wish to receive denju (Reiki seminar) or if you are suffering from diseases, please contact Ms. Takata or Mr. Bunki Aoyama (Teatments Manager) at the Globe Hotel on Nu’uanu Avenue. 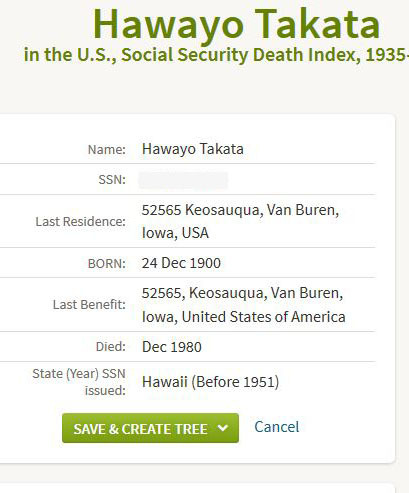 Ms. Takata is second generation Japanese American born in Kauai. In the winter three years ago, she spent about six months at my clinic in Tokyo to enthusiastically learn this method. Two years go, she returned to Kauai in July and started to do treatments and give denju (teach Reiki) with the number of her students reaching to over 50 people. Last July, Ms. Takata suddenly visited my home and recommended to me a sightseeing trip to Hawaii. I accepted her invitation and I arrived in Honolulu on October 2nd accompanied by my daughter. I appreciated the sincere welcome from everyone when I traveled to Kauai on the 4th and met the local members. I came back to this city in late October and held 14 seminars since then, at the request of its devoted people. There were a large number of students each time and everyone understood the seminar very well. They are grateful for the happiness of good health brought by treating diseases easily, not only for themselves but also for their families. Since my stay in this city was prolonged unexpectedly, many people in Japan have been waiting for my return for a long time. I shall leave this memorable land behind and return to Japan on the 22nd, the day after tomorrow. I have received a sincere hospitality from everyone, especially from the members during my stay here and I was able to enjoy a pleasant time without feeling lonely at all during the trip. My daughter and I experienced the five long months just like it was a single day and this will remain an unforgettable joy for our lifetime. My daughter and I are deeply, deeply grateful for everyone’s friendship and kindness. I will conclude my remarks by sincerely wishing everyone health and happiness. Everyone take care ….. and good bye. ● Radio Station： The radio station, “KGMB radio” in Honolulu that broadcasted this farewell greeting exists now under a different name, “KSSK”. The US military used KGMB’s signal to check its positioning and it is said that the Imperial Japanese Navy used it to identify the location of Honolulu when attacking Pearl Harbour. You might notice that “Sunday morning” is written as “サンデー朝" (mixed with katakana and kanji), instead of “日曜日の朝” (mixed with hiragana and kanji). *** Using English words written in katakana as part of their regular Japanese conversation seems to have been common back then. ● It is written as Usui Reiki Ryoho, not as “Usui Shiki” Reiki Ryoho. It is certainly a different expression from that Ms. Takata was using. ● When master Hayashi mentioned “members” in this speech, I think he referred to the members of Hayashi Reiki Kenkyukai. It is quite a big achievement that 350 people became members by the time Hayashi returned to Japan. As I have already commented with the article of February 12th, I think the number of people who took the seminar and the number of members are almost equal. It is interesting to know that Caucasians and Chinese were also included. 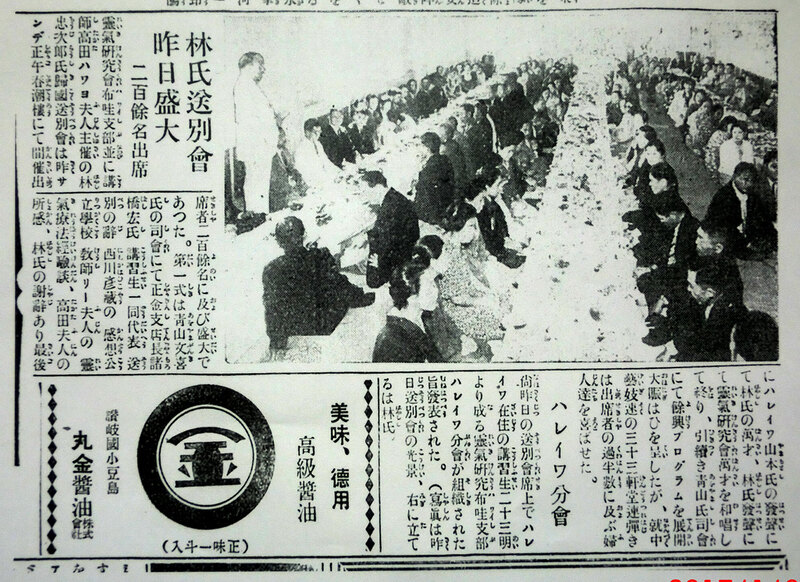 ● Importantly there were about 5,000 members of Hayashi Reiki Kenkyukai in Japan. 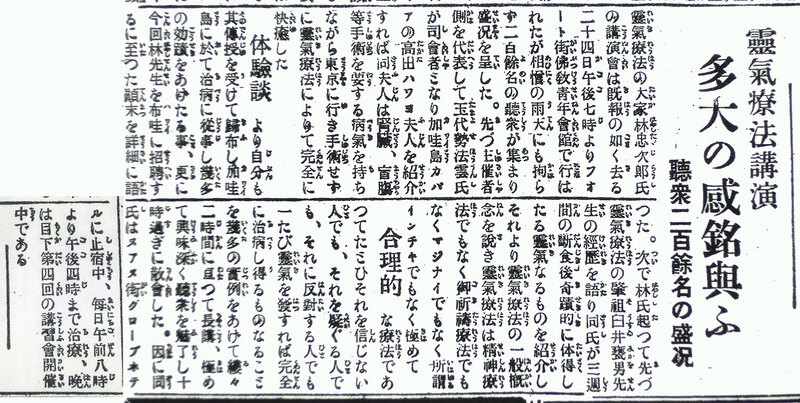 This speech is probably the only historical record stating the specific number of members of Hayashi Reiki Kenkyukai. 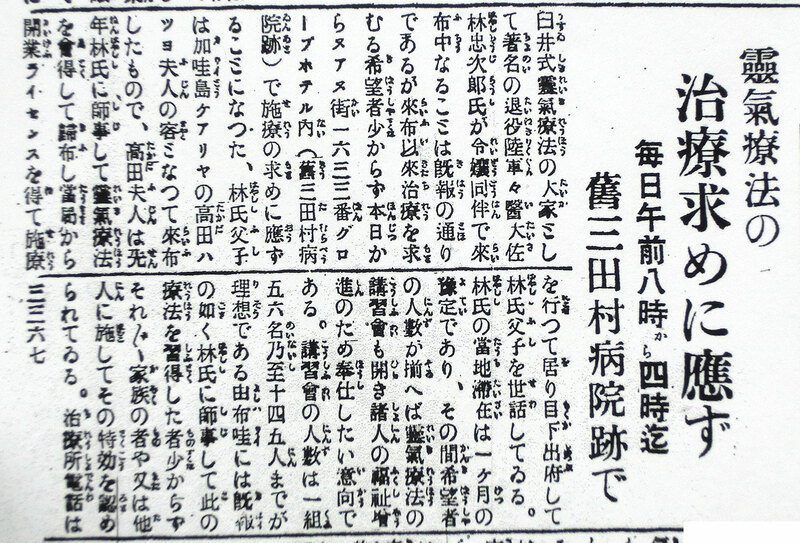 Another important point is that there were 13 Shihan (teachers) including Ms. Takata at that time. ● Master Hayashi is clearly stating the same travel history of Ms. Takata as her travel records which I have already mentioned ealier. ● Master Hayashi clearly stated that Ms. Takata had started to offer treatments and denju (teach Reiki) after she returned to Kauai in 1936. 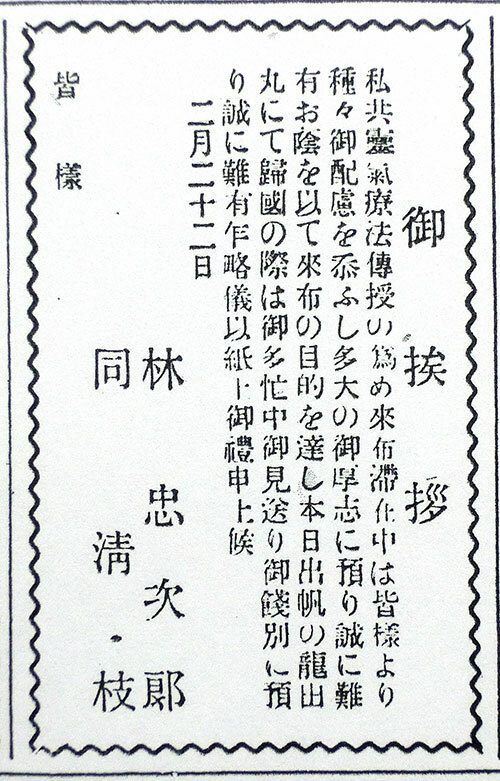 Takata registered over 50 members with Hayashi Reiki Kenkyukai. It is not clear if this number is consistent with the total number of her students, but at least, there is almost no doubt that she was teaching Shoden (First level) as Shihan-kaku (assistant teacher) at this time. In another page, I explain the Japanese teaching system for those who are not familiar with it and further discuss how Takata became a Reiki teacher. Please read this page. ● It is amazing to see that he held 14 seminars. I can calculate that there were an average of 25 people in attendance at each session (350 people ÷ 14 times＝25 people) Wasn’t it a great success? ● It is wonderful to see the report of people consistently enjoying positive results after learning Reiki! I imagine that his experience in Hawaii must have had a huge impact on master Hayashi as he was involved with so many people and spent a five long months there. 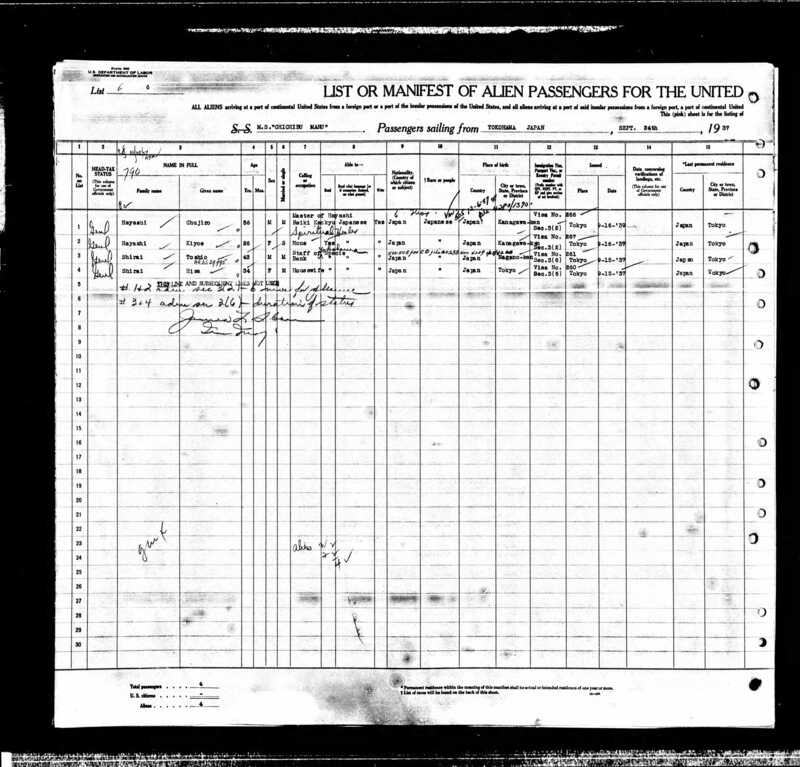 ● It was February 22nd, 1938 when master Hayashi departed from Honolulu on the Tatsuta Maru. It took about 1 week to get to Yokohama, so I guess he returned to Japan by the end of February. 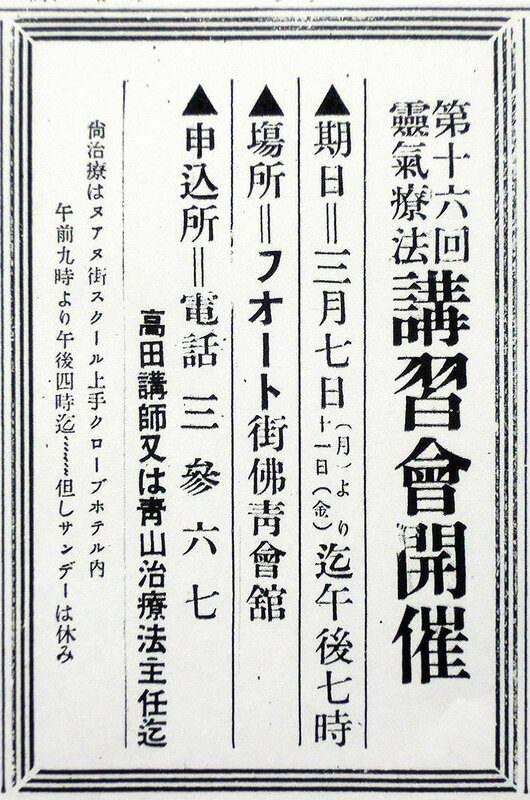 In fact, it was in late March in 1938 at the Daishoji branch that Chiyoko Yamaguchi attended her first seminar under Hayashi. Therefore, I conclude that Hayashi headed to Ishikawa prefecture soon after he returned home to Tokyo. These two events, Hayashi’s stay in Hawaii and Chiyoko’s first seminar, occurred one after the other. ● Makiki (マキキ) Navy cemetery is located in Honolulu, and it is a cemetery for Japanese, not Americans. See here for further details. ● It seems that they were able to post telegrams from the ship! ● Master Hayashi had gone back to Japan by this point and from now on, Ms. Takata is the main character. The number of seminars continues to grow as it is written as the 15th seminar. The session was taught by [Teacher] Hawayo Takata & [treatment manager] Bunki Aoyama. It seems likely that they were using the Globe Hotel and the Buddhist Youth Hall as their venues. ● This article is written about the last seminar held by master Hayashi (his 14th seminar on Hawaii). There are 126 people in the photo. As it is impossible to hold a seminar with this many people, and as since it is written as “The group photo of the last evening”, so I imagine that additional people had gathered to celebrate the last day. There was a regular meeting in the same week on Monday 14th, so I imagine that the last day of the final seminar must have been on Saturday, February 19th (A seminar was 5 day long. This 14th seminar must have started on Tuesday and ended on Saturday). ● I found out that the photo that I have from the past (on the right →) was actually trimmed on both ends. I must have obtained this photo from another source as there is nothing written about the photo in this newspaper article. Although, you will see the year is written as 1937 in the photo on the right, I believe that the year was written incorrectly. I have enlarged it. 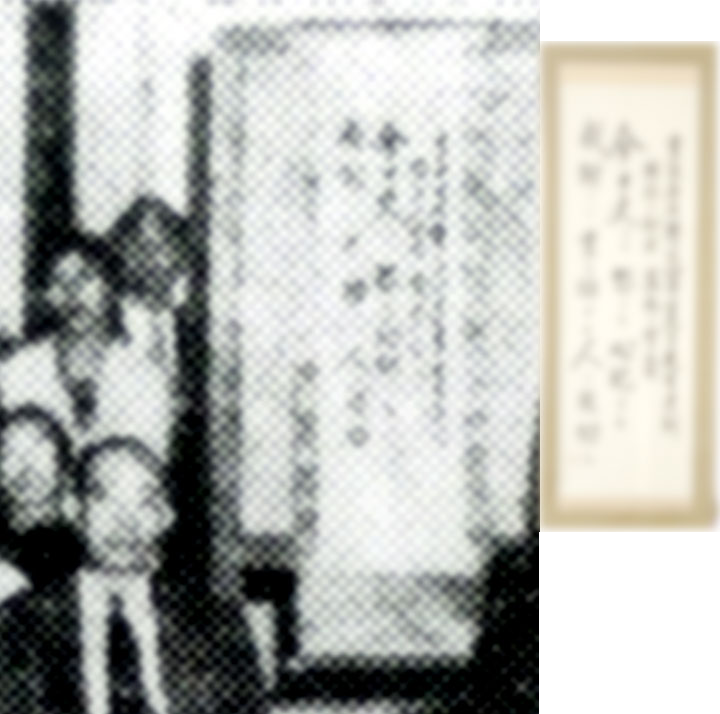 The person who is sitting beside the kakejiku (scroll) might be master Hayashi! The face certainly looks like Hayashi. It is probably Takata who is doing the demonstration, however it is not clear enough to see her face. There were/are many replicas of the Gokai scroll. 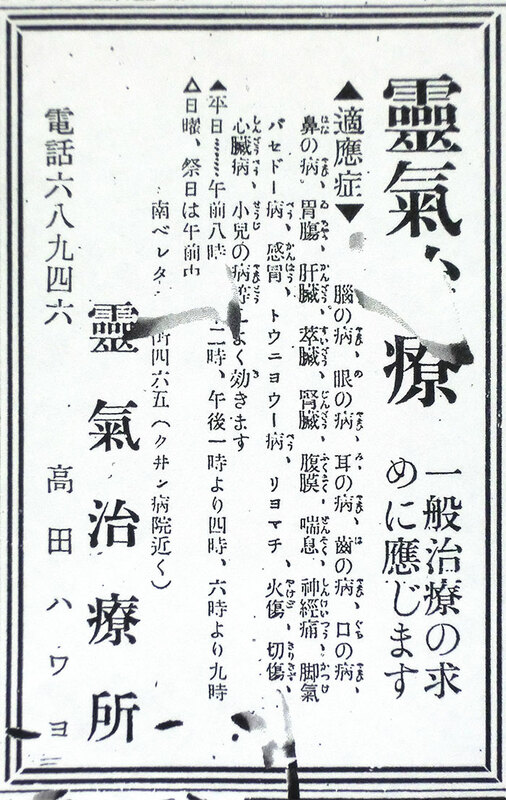 Every Shihan was required to hang the scroll and Shihan-kaku was encouraged to do so everytime when they gave Reiyu. So, there were at least 13 replicas and probably much more. (The number of Shihan was 13, and that of Shihan-kaku is not know.) This particular scroll in the picture was just one of those. Fokke Brink, a student of Phyllis Lei Furumoto (Takata's grandchildren), told me (Nishina) that he saw a picture of Ms. Takata with the Gokai scroll and that a Reiki practitioner in Idaho now possesses her scroll as the inheritance of Ms.Takata given from Phyllis Furumoto. How wonderful the scroll survived ! ● The MC is Mr. Bunki Aoyama (青山文記). Also the names of Mr. Masaichi Ueda (植田政市), Mr. Seihou Tsuchiya (土屋青芳), Mr. Suekuma Takaki (高木末熊), Mr. Hikozo Nishikawa (西川彦蔵) appear in this article. Kanji writing of Mr. Ueda is different again, and is correct as, “上田” or “植田”? Mr. Suekuma Takaki’s name is a unique name, so I researched about it. 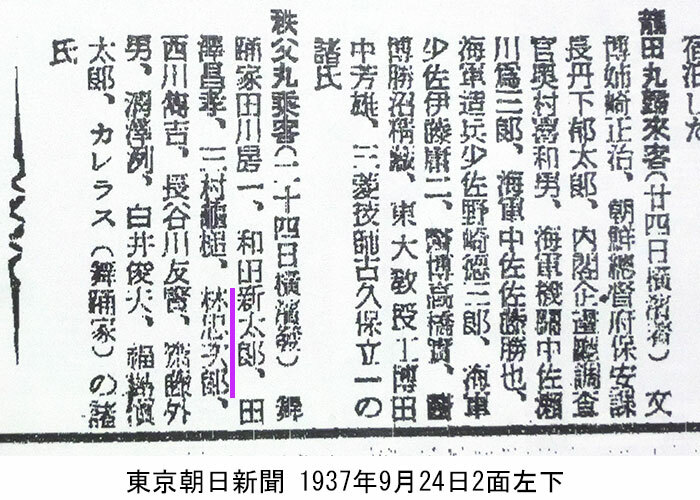 It is written as "A president of Chosen Jiho (Korean Times) in Pusan during the Meiji era", however, I am not sure if this is correct. ● It is about Ewa (エワ), the place where a public lecture was held on February 5th. You can see that there was a Ewa Branch established already. ● It is amazing to see that seminars continued every week even after master Hayashi returned to Japan! I am very curious to know how many times Ms. Takata held seminars in the same style as those held by Hayashi. “妾” means myself in very humble form for a woman. ● This information completely matches the travel record shown previously. “羅府” means Los Angeles, “桑港” means San Francisco, when written in kanji characters. I have researched the names of the two foreigners in this article but I could find no additional information. 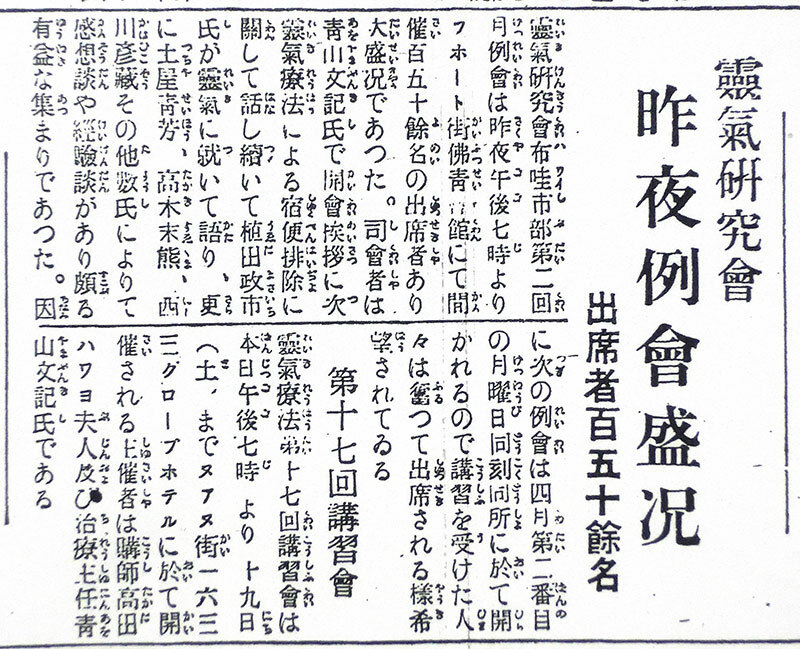 Mr. ”Kyokujo Kubokawa (窪川旭丈)” may be the Buddhist who was known to be active in Los Angeles. ● It is possible that Ms. Takata held seminars on the West coast of America, but it is unproven at this point. During her absence in Hawaii, six of her disciples seemed to have responded to treatments . ● This is the advertisement that was issued one day prior to Ms. Takata return from the West coast of America. It appears that there had been three sections for the treatment times: 8am ~ 12pm, 1pm ~ 4pm, and 6pm ~ 9pm. ● It is written that the clinic will change its location as of November, but it had actually moved at end of June. The new location is at “465 South Beretania Street, Honolulu, HI 96814” and it is far from the downtown Honolulu. 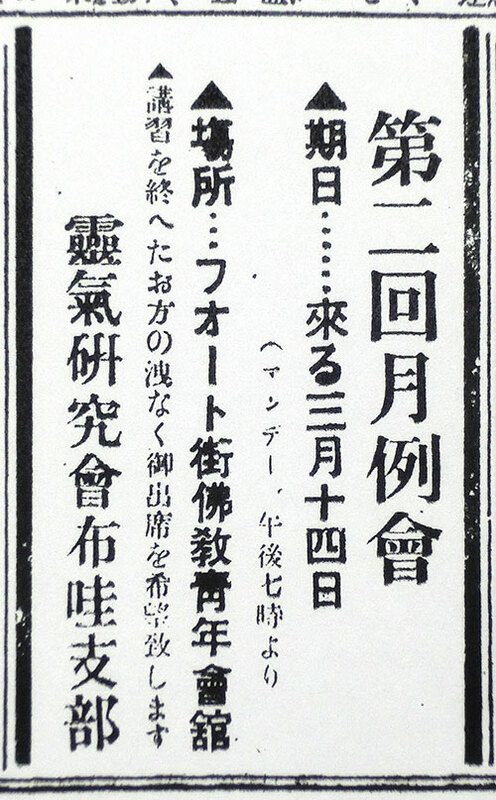 Kuin (ク井ン) Hospital still exists under the name, The Queen's Medical Center close to this address. ● This move may turn out to be important information. 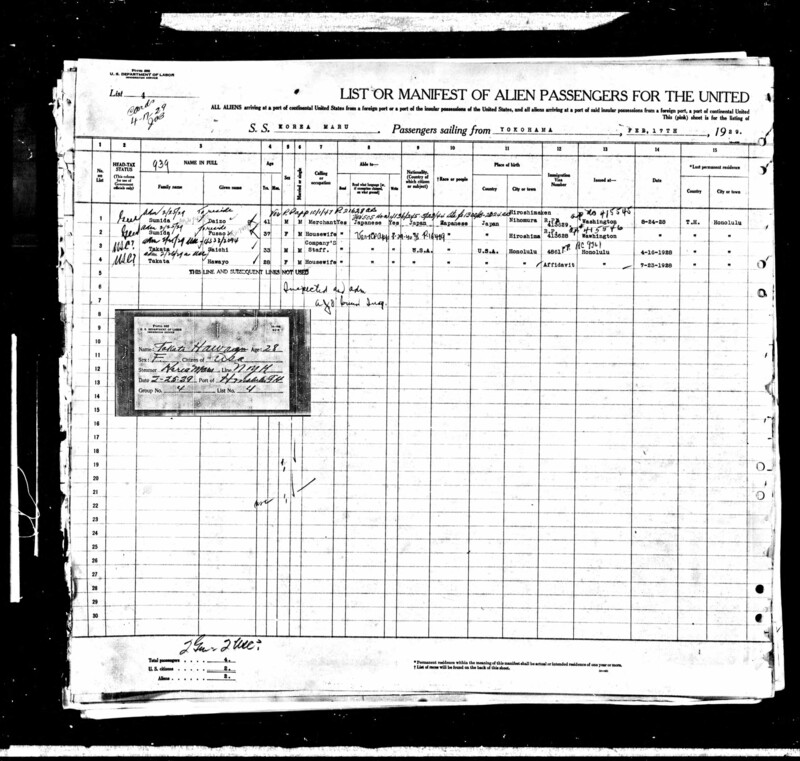 The address of Mr. Bunki Aoyama, the treatment manager, continued to be at the original Nu’uanu Avenue location until 1942, however his name disappeared from the articles after this. I wonder what might have happened between Ms. Takata and Mr. Aoyama. 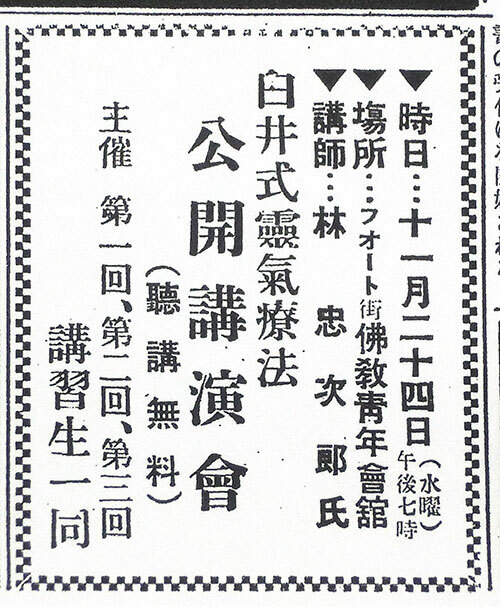 ● The title says the 3rd regular meeting (例會)↑, but it is actually the 5th (第五回) regular meeting as writtin on ←the advertisement of the same day. ● The clinic had moved its location by this time and also the phone number had changed. "465 South Beretania Street, Honolulu, HI 96814" is located far from downtown Honolulu. 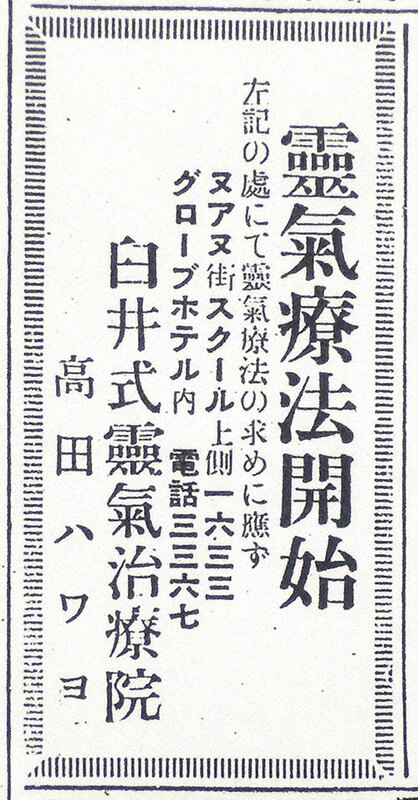 Kuin (ク井ン) Hospital still exists as “The Queen's Medical Centre” and is close to this address. ● Previously, Ms. Takata’s address in 1938 was written as “1808 S Beretania”, so the clinic was located on the same street as her residence. 1937.11.18 Kauai branch established Waimea branch, Kapaa branch? 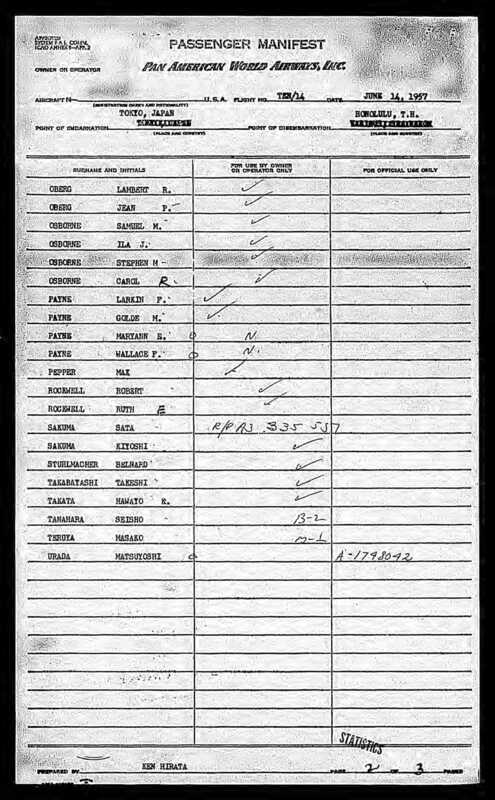 1937.11.18　 Kauai Branch established Waimea branch, Kappa branch? 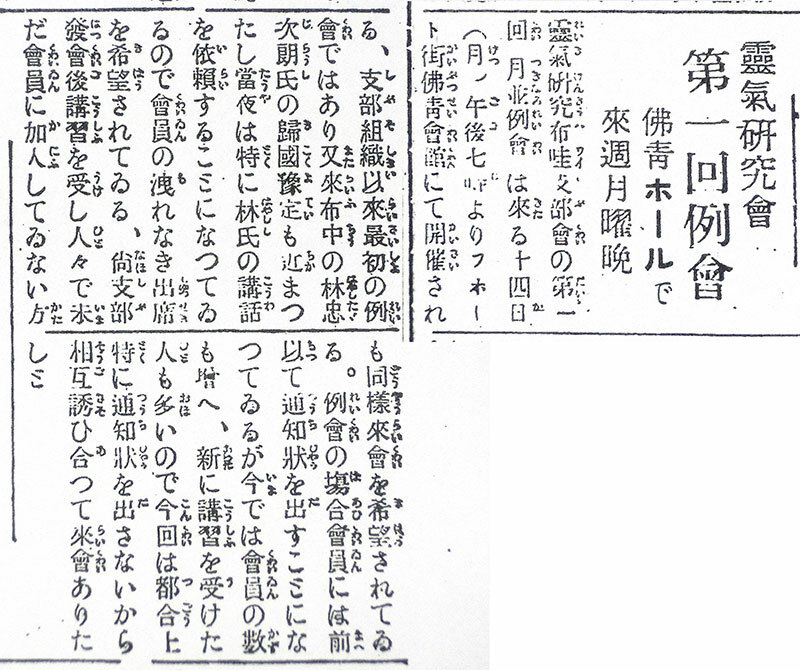 Takata had already been teaching Reiki probably as Shihan-kaku after returning from her first visit to Japan (1936~). Hayashi stayed in Hawaii from October 2nd, 1937 to February 22nd, 1938, and held seminars and lectures mainly in Honolulu. The seminars were held twice in Kauai and 14 times in Honolulu, and just about every week. The number of total participants is over 350 people. Seminars was basically held for 5days, Monday to Friday from 7pm ~ 9pm. He held four public lectures, all at no charge to the participants. Kauai Branch, Hawaii Branch and two local groups were established. There were monthly meetings held for members. 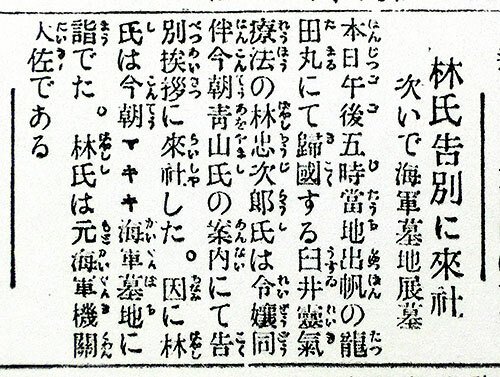 Takata called it “Usui Shiki Reiki Ryoho”. This might be the origin of “Usui Shiki” that is now common overseas. There appeared to be a hair salon that hosted Reiki treatments. 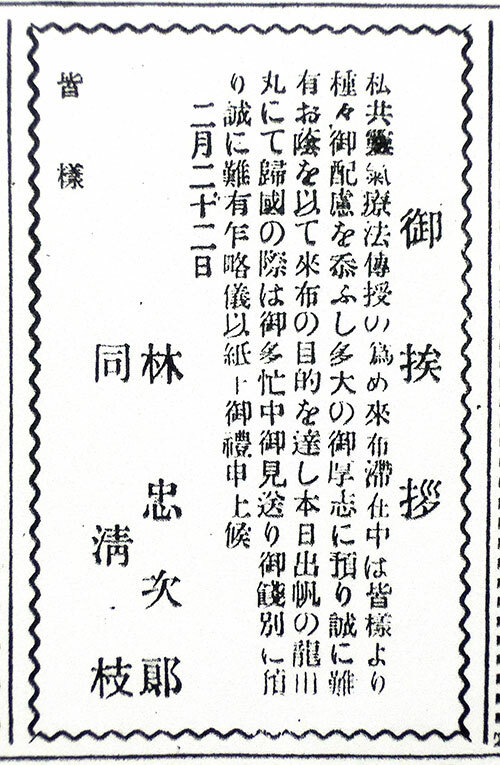 The Gokai scroll that was used back then is exactly same as the one that is used in Jikiden Reiki today. There were about 5,000 members of Hayashi Reiki Kenkyukai (institute) in Japan. 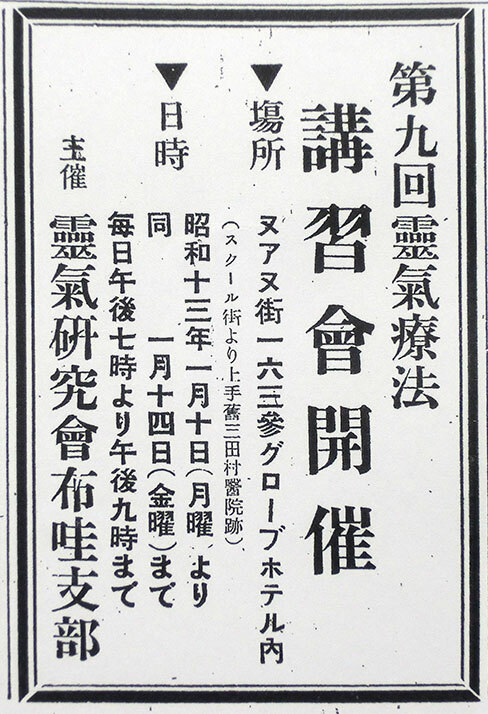 Osaka branch (with many members), Kyoto, Nagoya, Daishoji, Chichibu, Sendai, Morioka, Aomori; all these locations had either branches or local groups. There were 13 Shihan (teachers) under Hayashi Reiki Kenkyukai back then, and Takata was the only person so qualified overseas. 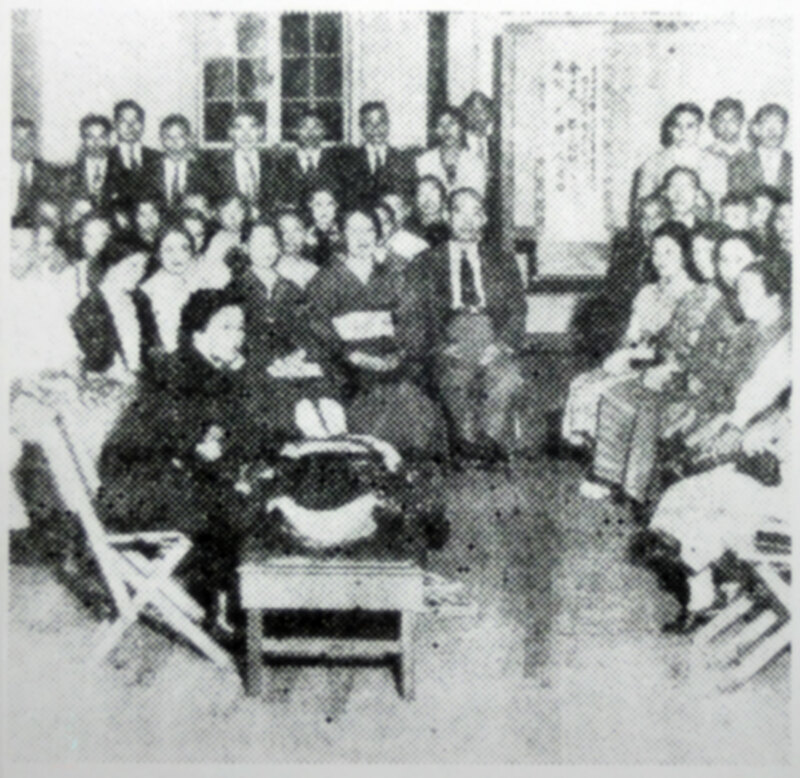 After Hayashi had returned to Japan, Takata took on her role as Shihan / teacher and continued offering seminars. Often there are mis-spellings of names in Hawaii Hochi, so we need to pay close attention. The seminar offered was of the same style as Jikiden Reiki (i.e. for 5 days), but was it only for 2 hours each day. Didn’t they practice in the daytime?. Why was there a different schedule than that used in Japan where lectures were in the morning and practice in the afternoon over 5 days? Were they able to master it in just 2 hours over 5 days? Entry fee and tuition fee are unknown. They used a bed-like table that was knee height for the demonstrations but it is unknown how the students actually practiced. The seminars were held in the evening, but I wonder what were people doing during the day times? 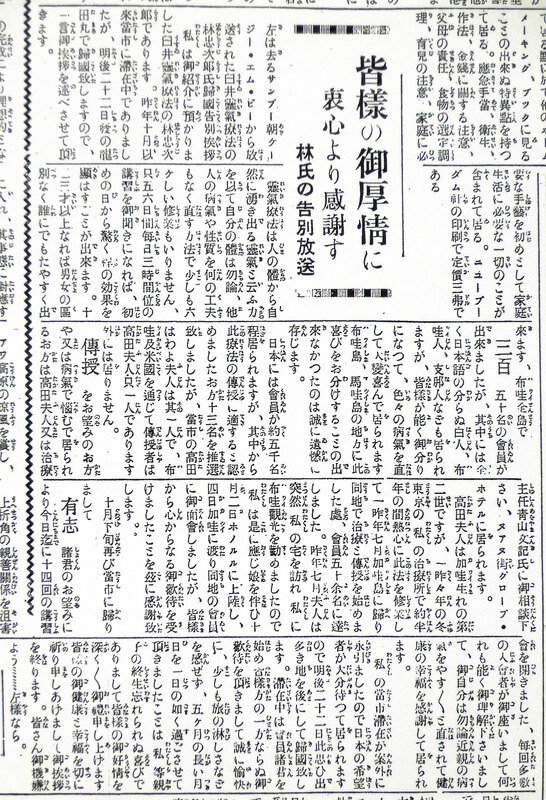 According to the articles, master Hayashi and Takata were also giving treatments in daytime. Would it be possible that the students were giving treatments or practicing as a part of their training? As shown in the picture, there were many women students and some of them should have enough time to do practice in daytime. When it comes to the content of the seminar, I couldn’t guess anything at all from the newspaper articles. 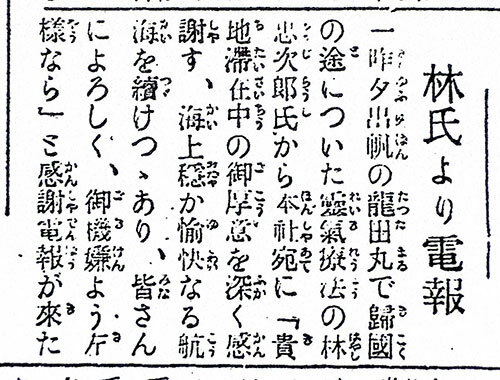 Words like Reiju, Gokai, Ketsueki Kokan Ho, Byosen, Seiheki Chiryo, and Enkaku, don’t show up in the articles at all. Since the Hawaii seminars took place in the midst of master Hayashi’s full career, it seems reasonable to assume that the content of Hayashi’s teaching on Hawaii would be the same as that provided to students in Japan. Takata had attended all (1st ~ 14th) seminars as Hayashi’s assistant, so I think Hayashi’s teaching style would have become quite familiar to her. Therefore, after Hayashi returned to Japan, Takata would have taught the seminars in the way that Hayashi had taught to Hawaiian students, i.e. Japanese Reiki equivalent to Jikiden Reiki today. As a teacher, Takata held four seminars in the month of March, 1938, thus we can estimate that Takata may have taught the Japanese Reiki to probably nearly a hundred of people. When we think of “Hawayo Takata”, there is a strongly held impression of her as an originator of Western Reiki, which has many differences to Japanese or Jikiden Reiki, but in fact, it can be said that she was teaching the Japanese Reiki thoroughout her early years as a teacher. Yes, Takata was a notable teacher of the Japanese Reiki. However, Takata began teaching Western Reiki more than 30 years after this period in time. This difference in time and the war would be what separate Japanese Reiki and Western Reiki. Often there were misspellings of people’s names in Hawaii Hochi, so we need to pay close attention. It is possible that it is written incorrectly if you see a name that appears only once in the articles. Chusuke Tahara (田原仲亮): Principal of a Japanese language school. He seems to have learned Reiki in May of 1933. Saeko Noda (野田サエ子): Owner of a hair salon、He husband seems to be Gikaku Noda, the founder of a baseball team (Steere Gikaku Noda). 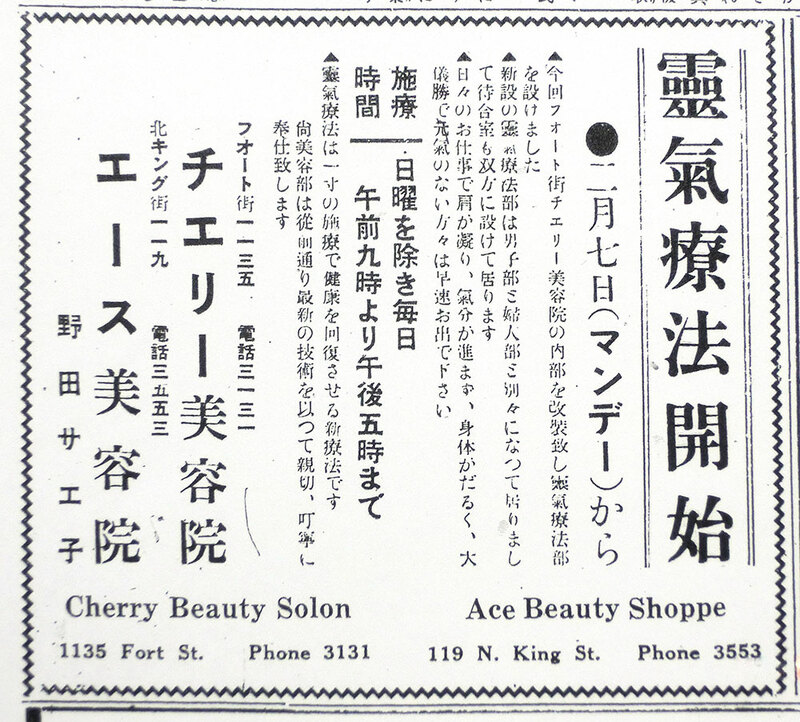 Saeko had owned at least two hair salons in Honolulu, and one in Ginza as well. (Famous people in Hawaii、In Wikipedia、Book: History of Beauty (Biyo no Rekishi)) She was once noted to be taking registration for the Reiki seminars. Also she has renovated her hair salons in Honolulu to be able to provide Reiki treatments there. However, once the war broke out, the hair salons were forced to shut down. 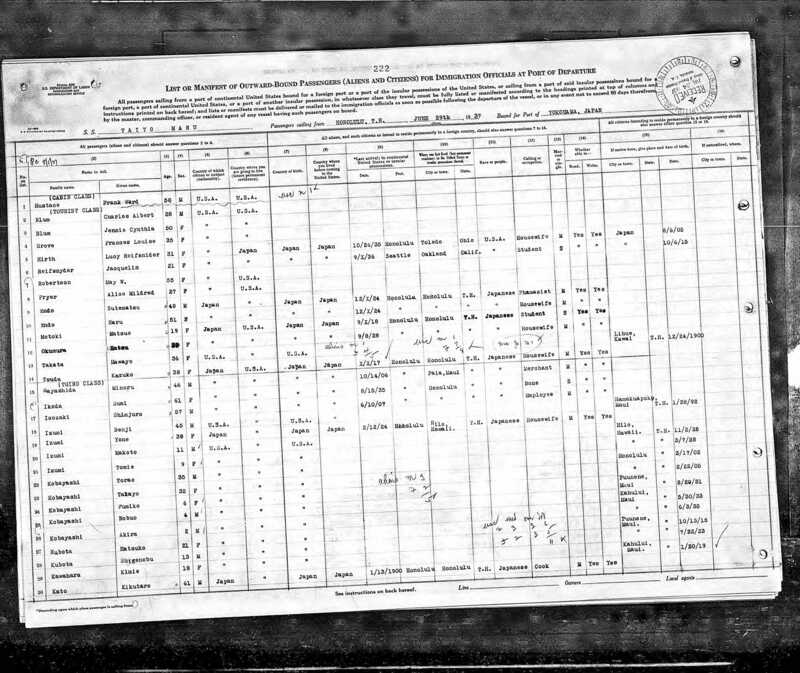 It is possible to find information about Mr. and Ms. Noda. 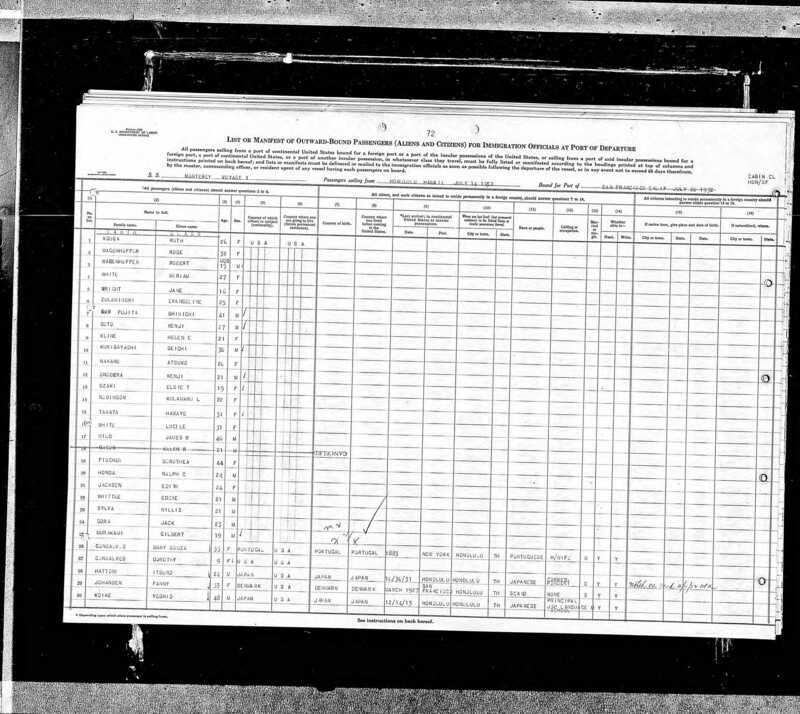 (Document 1、Document 2、Document 3) Mr. Steere Gikaku Noda (Gikaku Noda), her husband, was a very famous person as he had received the 5th Kyokujitsu-sho (The Order of the Rising Sun; the first national decoration awarded by the Japanese government) as a baseball player, a lawyer and a politician after the war. Mr. Tsurutani (鶴谷): Owner of the house where seminar was held in Waimea on Kauai Island. 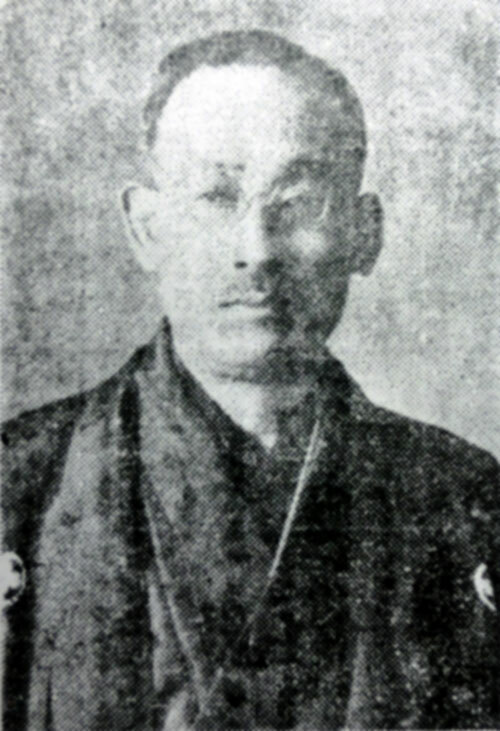 Nobuo Watamura (綿村信男): Owner of the house where seminar was held in Kapaa on Kauai Island. Mr. Fukuma (福間): Japanese Imperial Consul-General of Kauai. His wife and Mr. Hayashi were acquaintances. 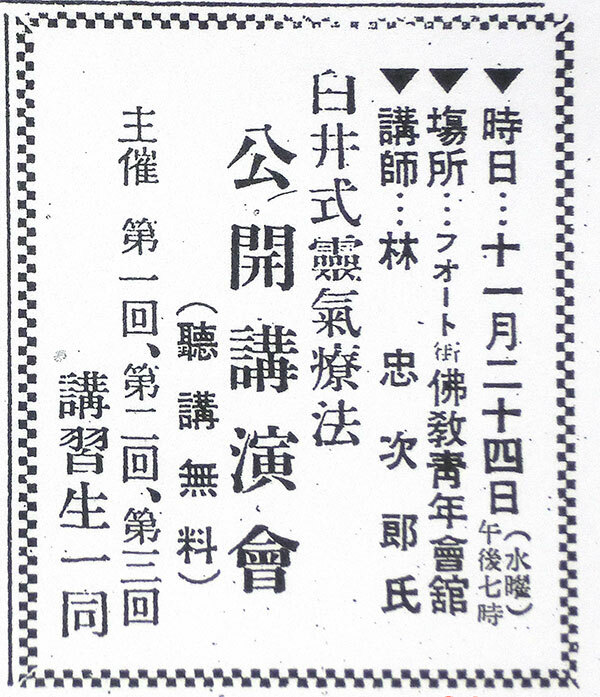 Houji Ooe (大江法爾): Member of Waimea Branch. Bunki Aoyama (青山文記): Reiki treatment manager, He was in the second position after Takata in Honolulu. In spite of being an important person, his occupation is unknown. 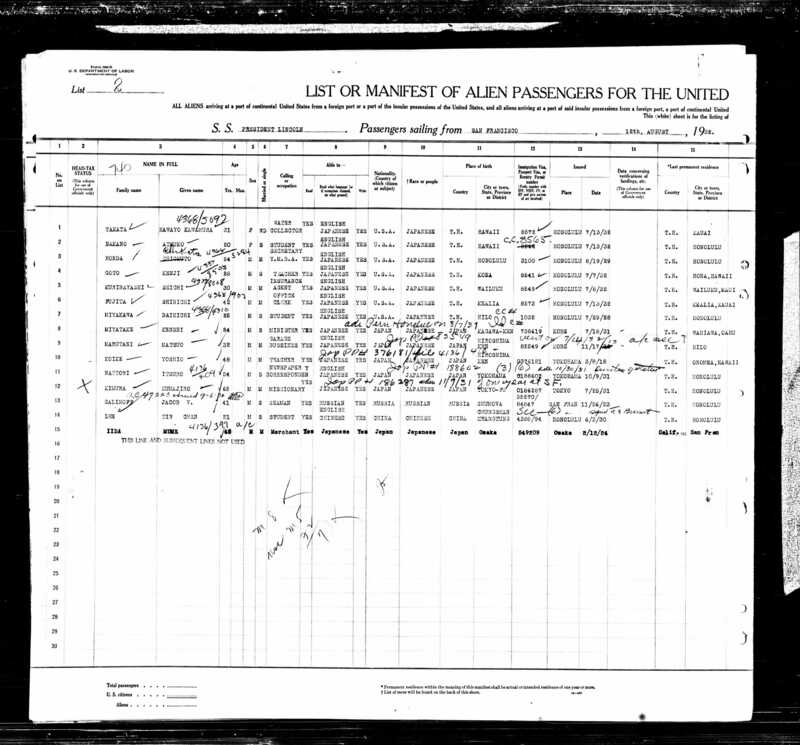 According to www.ancestry.com, he was born in 1885 and his wife, Hakemp, was 5 years older than he was. 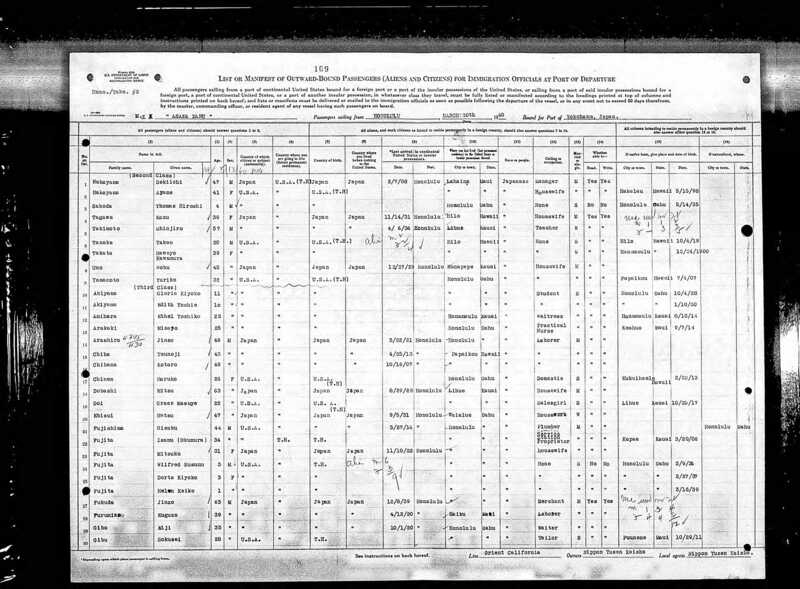 He immigrated to Hawaii on 1906. He was about 50 years old at that time. 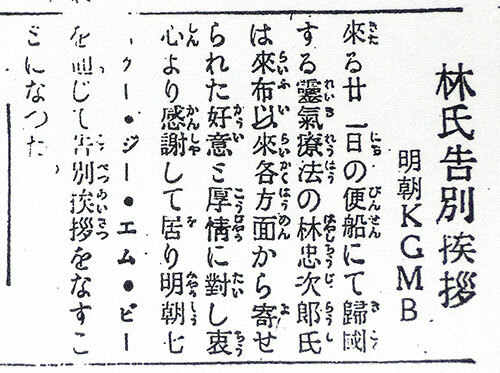 His travel records shows that he went to Kyushu, and it says he was originally from "Kumamoto-ken, Hotaku-gun, Kengun-mura"" but perhaps this means “熊本県飽託郡健軍村”: These kanji “健軍村” could be read as “Kengun-mura” if people didn’t know how to read it properly. 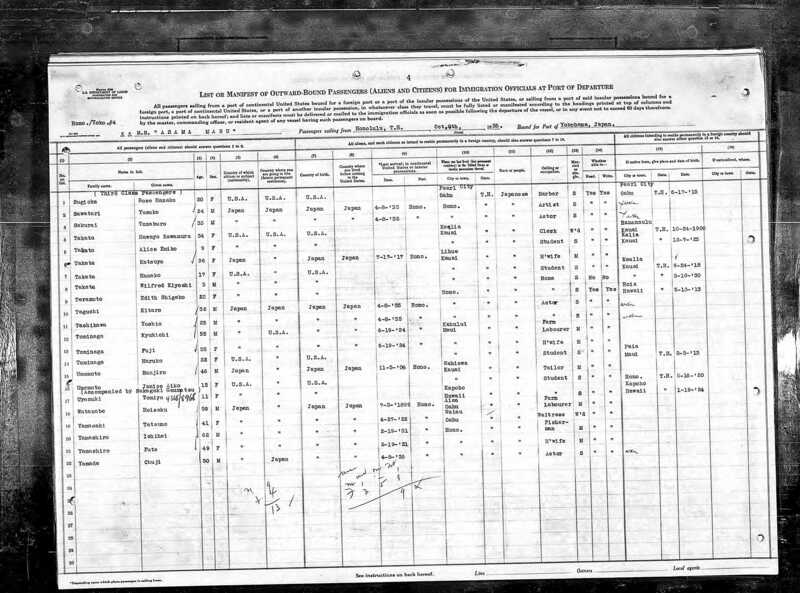 His nationality was still Japanese in 1936. 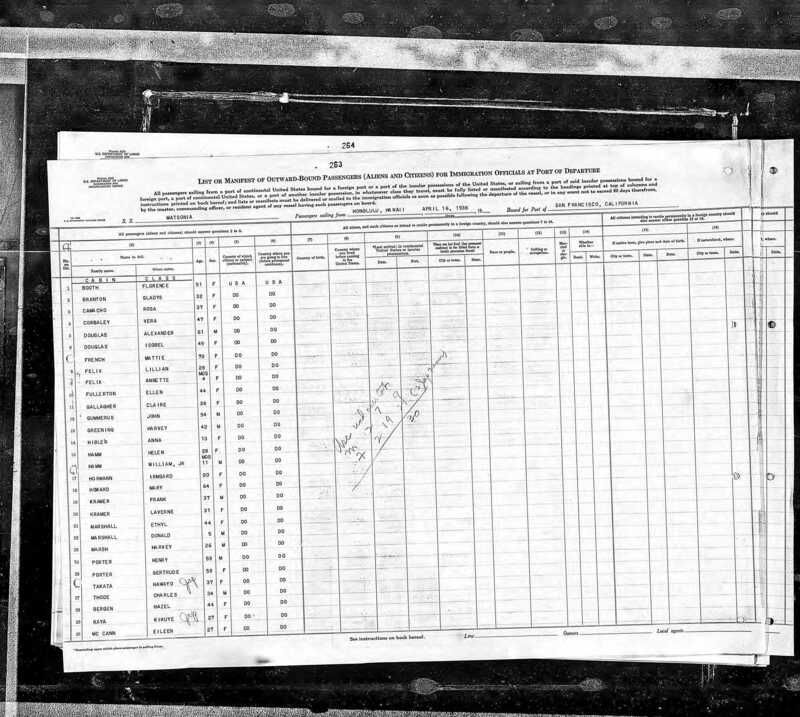 His occupation was listed as farmer, cleaner, and housekeeper at hotels etc. What is very interesting is that his address was “1633 Nuuanu av” from 1938 to 1942.This is the location where treatments and seminars were held. It is possible that he lived there while engaged in all his activities, and he was there even after the war began. 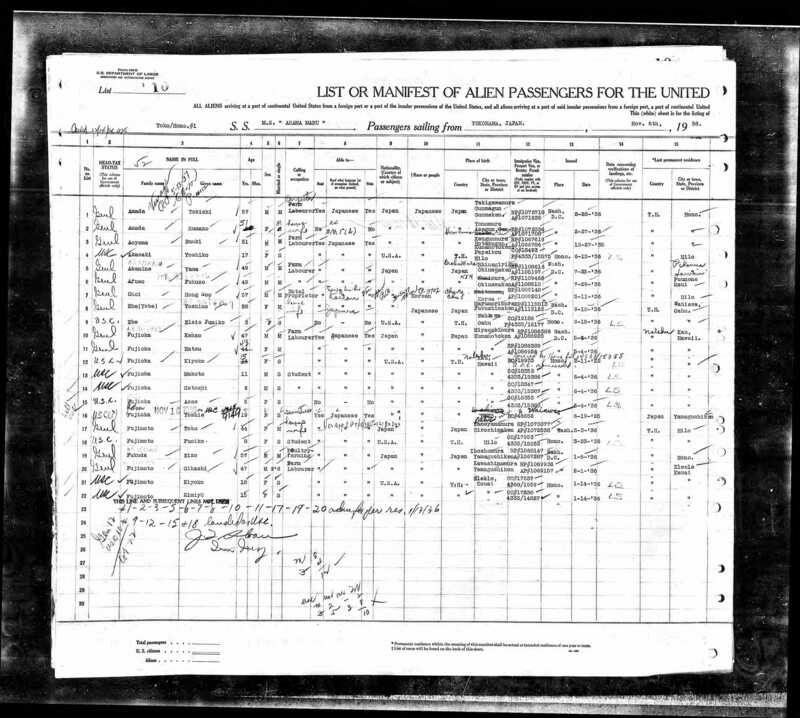 It appears that he didn’t have any children according to the records. Masaichi Ueda (植田政市): Treasurer of Reiki Hawaii Branch. It seems that he posted his testimonial on the newspaper as “M.U.”. In the article, it is written “Because of my occupation, I am interested in general health for others and, of course, for myself.”, therefore it is possible that he might have been a practitioner of some other healing methods. Hiroshi Morohashi (諸橋宏): Manager of Yokohama Shokin Bank Honolulu Branch. He represented all of Hayashi’s Hawaii based students at the farewell party. Sentaro Ishii (石井仙太郎): He gave a toast of Banzai at the farewell party. 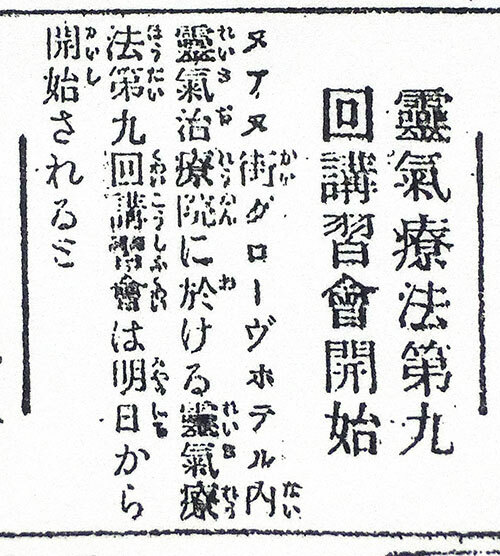 Gensaku Namamura (中村源作): He might have been doing both Nishi Shiki Kenko-ho and Reiki. Hikozo Nishikawa (西川彦蔵): Gave a speech at the farewell party. Also, gave a report at the 2nd regular meeting. Ms. Lee: School teacher. She talked about her experience at the farewell party. 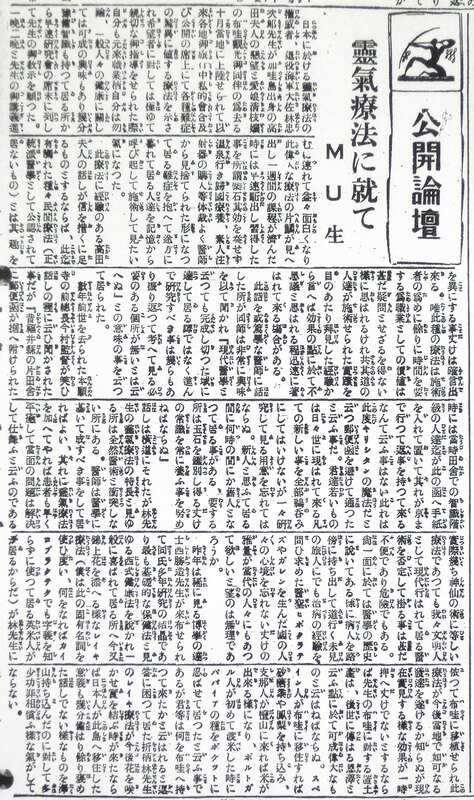 Seihou Tsuchiya (土屋青芳): He gave a report at the 2nd regular meeting. Suekuma Takaki (高木末熊): He gave a report at the 2nd regular meeting. 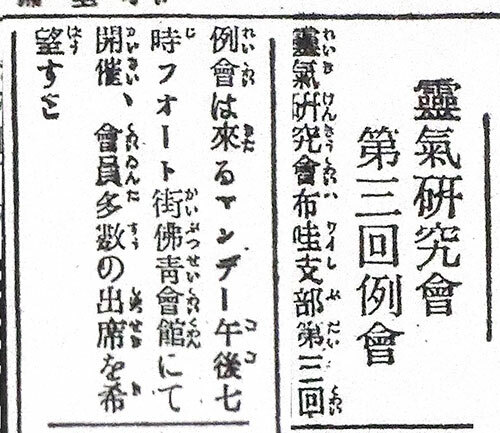 Perhaps, he was a president of “Korean Times of Pusan” during the Meiji era. 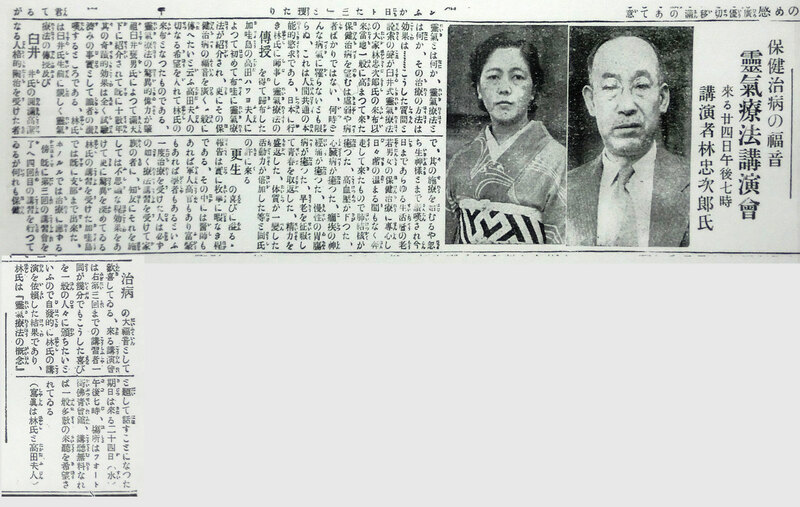 Through the discovery of these Hawaii Hochi articles, I think that Ms. Takata’s footsteps and master Hayashi’s activities in Hawaii become very clear. I am again deeply grateful to Mr. Justin Stein and Ms. Hirano Naoko. C.K., who helped me with the visual investigation of all the microfilm (which gave us headaches) thank you so much for your help with finding so many articles. The translation of original Japanese manuscript was done by Mari Okazaki, dai-shian of Jikiden Reiki and edited by Mike McCarty, Jikiden Reiki shihan-kaku, board member of Jikiden Reiki Association of Canada. I am very grateful for all their efforts. and Ms. Takata in Hawaii? 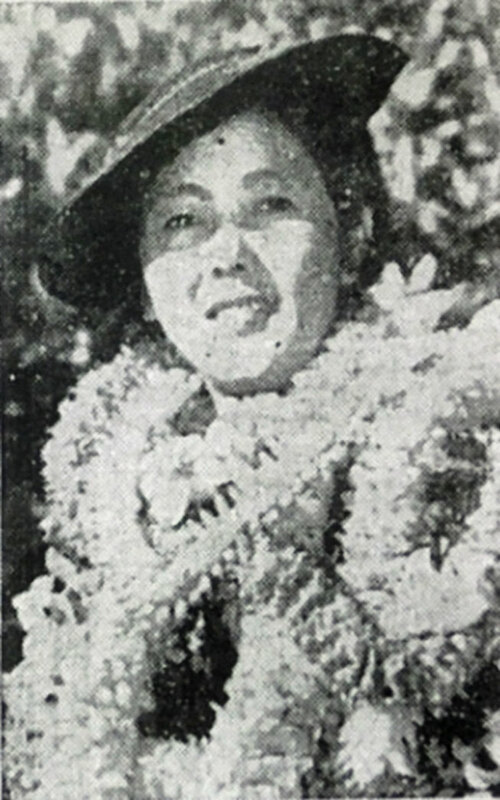 Takata had taught 50 members following her first return from Japan, then 350 people were added because of Hayashi’s visit to Hawaii. The total numbers of members add up to 400 people. They had Kauai and Hawaii branches as well as Haleiwa and Ewa local groups. There is no doubt that Takata continued to teach Reiki at this fast pace after Hayashi returned to Japan. There is no doubt that Takata was Shihan (teacher), however, I do not think she was able to teach Shihan-kaku seminar. To be able to teach Shihan-kaku seminar in Japanese Reiki, one needs to be Dai-shihan (senior teacher). Perhaps, there was no one who could teach students to be Shihan-kaku in Hawaii yet. 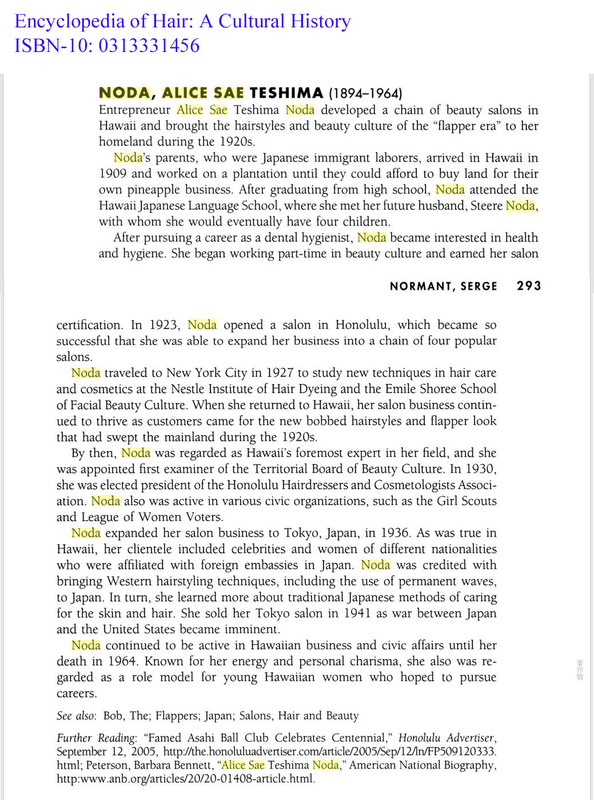 I will continue to research on the Hawaii Hochi articles after June 1938, but for now, according to the books published Fran Brown "Living Reiki: Takata's Teachings" and Helen J. Haberly "Reiki: Hawayo Takata's Story", it is said that Takata traveled to mainland America as an interpreter for a Jodo-Shu Buddhist monk after Hayashi returned to Japan. While in America she reportedly attended a school named the "National College of Drugless Physicians" in Chicago (I have searched for it but it doesn’t exist now) where she learned therapy and anatomical physiology. 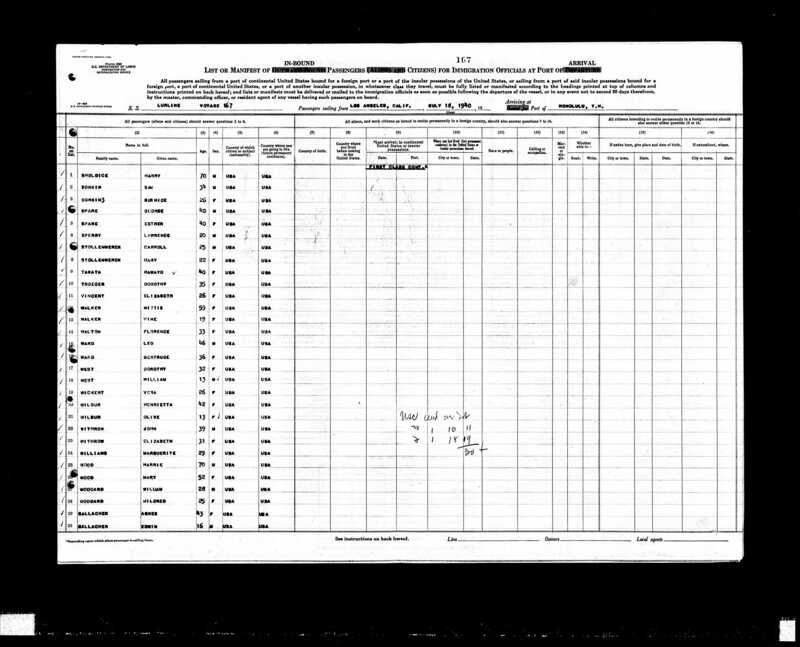 She returned to Hawaii in July 1938 and since then went back and forth around Honolulu and the Hawaii Islands and bought a house in Hilo, Hawaii. Also, it is said that she returned to Japan in a rush because Hayashi appeared to her in a dream at the time he passed away in 1940. It’s very likely she had been continued with Reiki treatments and seminars until the Pearl Harbour attack in 1941, however, the number of the people who took her seminars is unknown. There is no trace of her trying to contact to her students and clients after the war was over. It seem that those people who learned Reiki from Hayashi and Takata in Hawaii had disappeared. “Disappeared” might not be the right word, but maybe “couldn't continue”… Isn’t it a terrible thing to say that their enormous efforts written in this page have simply disappeared, just like that! Of course, the same thing happened in Japan, since only a hand full of people amongst those 5,000 students of Hayashi continued to practice Reiki. Once again, it made me realized the horrorible influence of the war as I was putting this material together. I tried to find out what happened in Hawaii when the Japanese Imperial Navy started its attack on Pearl Harbour. Academic bulletin database from Aichi Gakuin University. In other words, as soon as the war broke out, Japanese Americans in Hawaii, especially those who were in a leading social position and Japanese enthusiasts were taken to the internment camp. Similar things happened in Japan when Japan lost the war and was occupied. But, unlike in Japan, leading civilians and some of innocent civilians were taken away and arrested in Hawaii. It is also a horrifying fact that there was a prohibition on meetings of more than 10 people as it written in the report. Under such circumstances, we can imagine how Usui Reiki Ryoho in Hawaii disappeared and that nothing remained after the war. Of course, there is no doubt that Reiki helped with people’s health at that time, but it is a very very sad ending. At first, I felt “How wonderful!” to see how Reiki had started to spread as I started my research. However, after realizing that everything had disappeared by the end, I began to feel an emptiness and sadness despite reading the exciting articles of growth by the branches and local groups that were established. However, after more than 30 years, Ms. Takata was the only person who felt a desire to revive the spirit of Reiki. Even this Takata, it took 30 years!